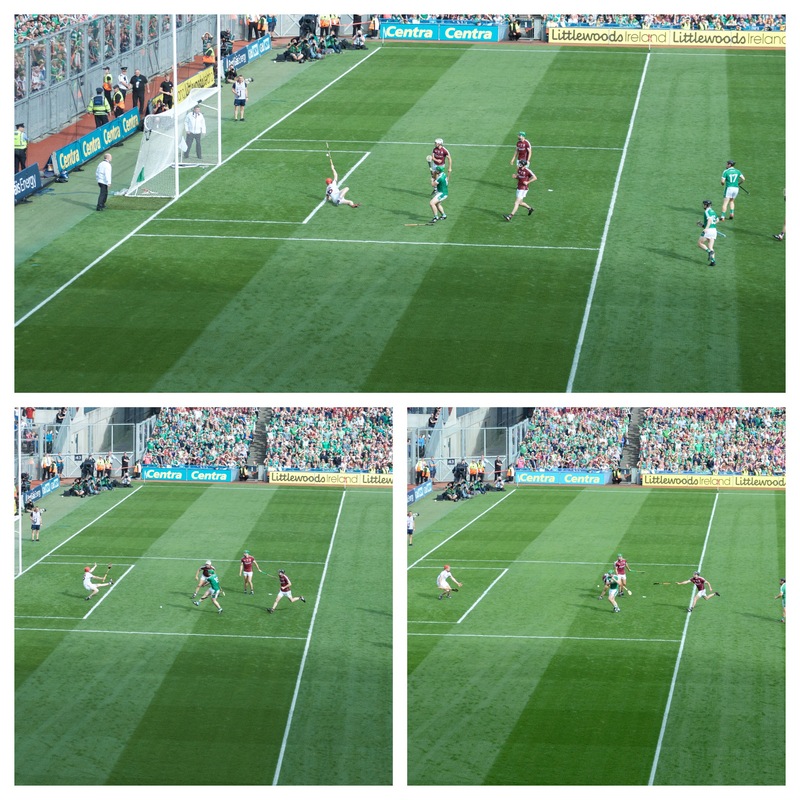 78 minutes and 38 seconds into Sunday’s All-Ireland Hurling Final and Joe Canning stands over a free in his own half under the Hogan stand. His Galway side that he has carried for the most part of this game find themselves trailing by 1 point. We are over time. A full 1 minute and 38 seconds of the 8 added on minutes over. The 82,000 inside the stadium and the millions watching on TV and listening on the radio hold their breath. Could Canning level the match? 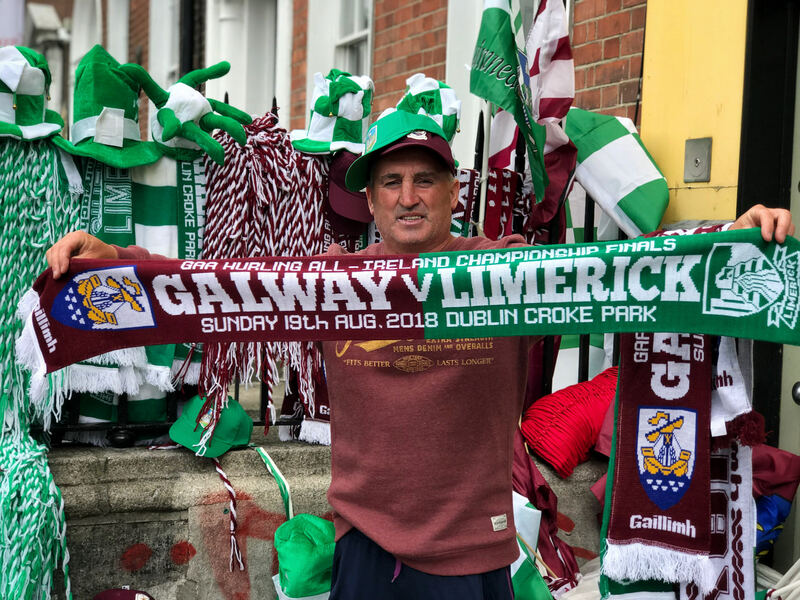 A Galway side that looked dead and buried on 68 minutes when Shane Dowling scored Limerick’s 3rd goal to give them a 8-point lead somehow rallied to bring the destiny of the Liam McCarthy for 2018 to a 1-point game. Joe Canning has been in this position before. In 2012, not too far from the spot he is now standing on, he scored a free into the Hill 16 end to salvage a draw for Galway against Kilkenny. This time he is further out and facing the Canal end a full 100 metres away. 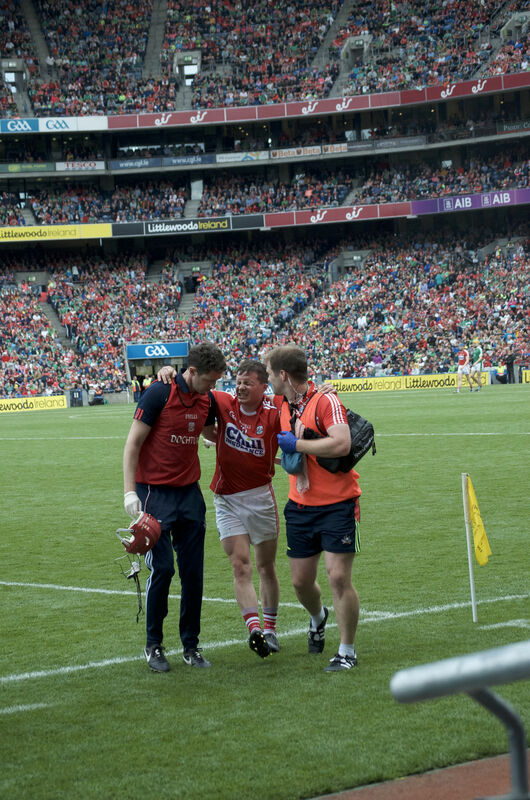 But this is Joe Canning; no ordinary man, no ordinary hurler. 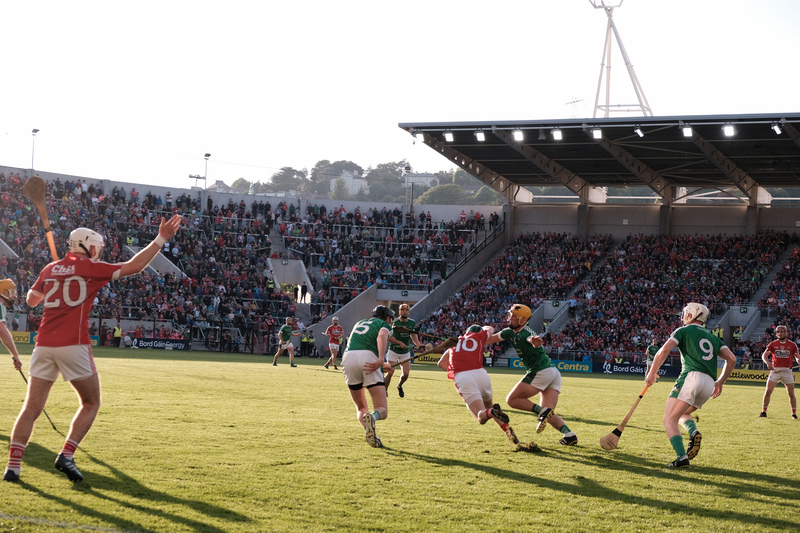 This has been the season of the comeback in hurling. Sides have seen big leads clawed back. And in the back of every Limerick person’s mind is 1994. 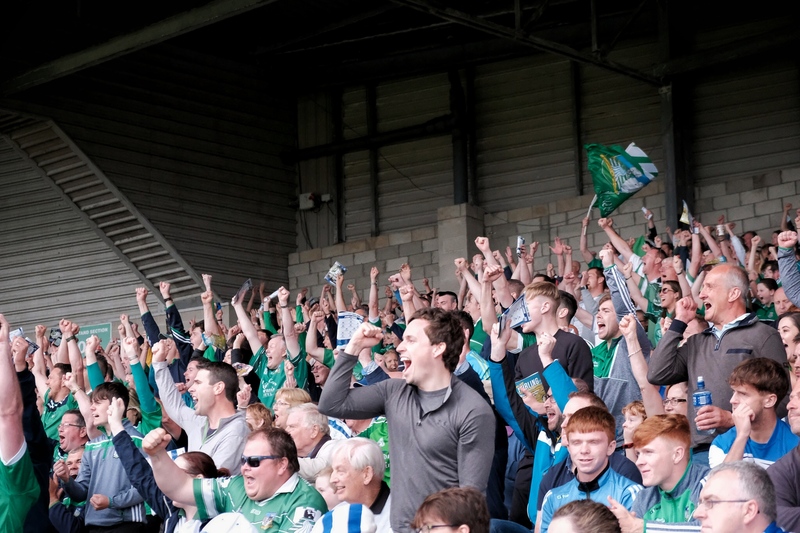 Could Limerick trip up when the end line is so close in sight again? Canning lifts and strikes. 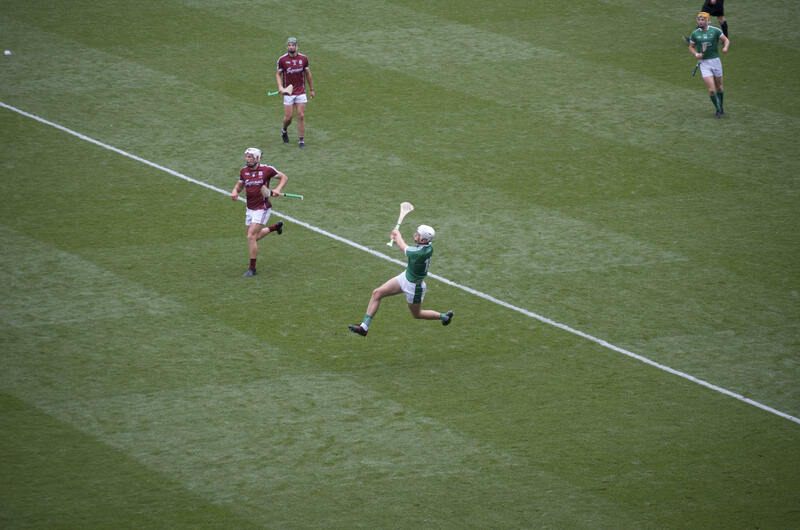 The sliotar soars and sails towards the Limerick goal. It is on target, but does it have the length? 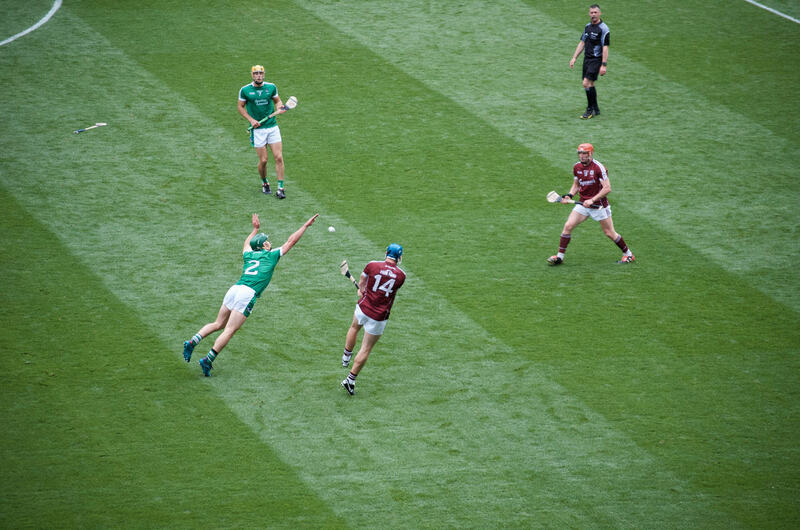 For 5 seconds it sails through the air before coming down in the large rectangle where 9 Limerick and 6 Galway players wait. The players tussle and swipe, desperately trying to get the sliotar. Then a green shirt breaks from the pack. 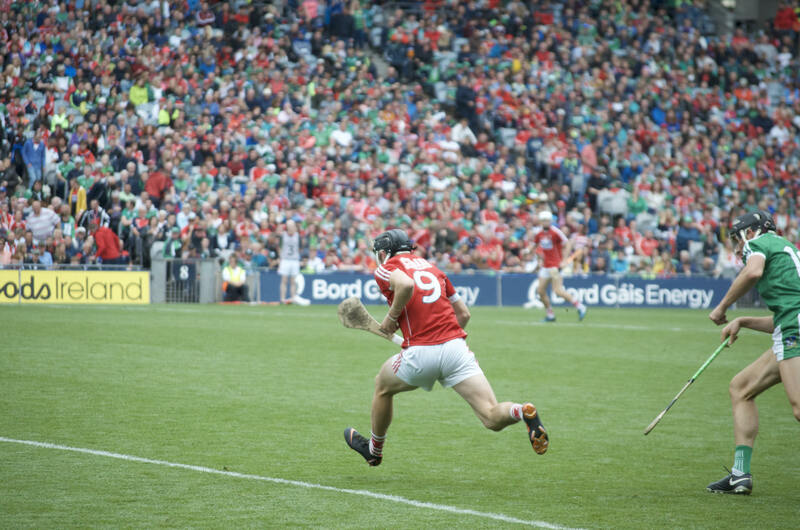 Limerick’s Tom Condon bursts out with the ball. The referee blows the final whistle. And with that 45 years of hurt disappears. 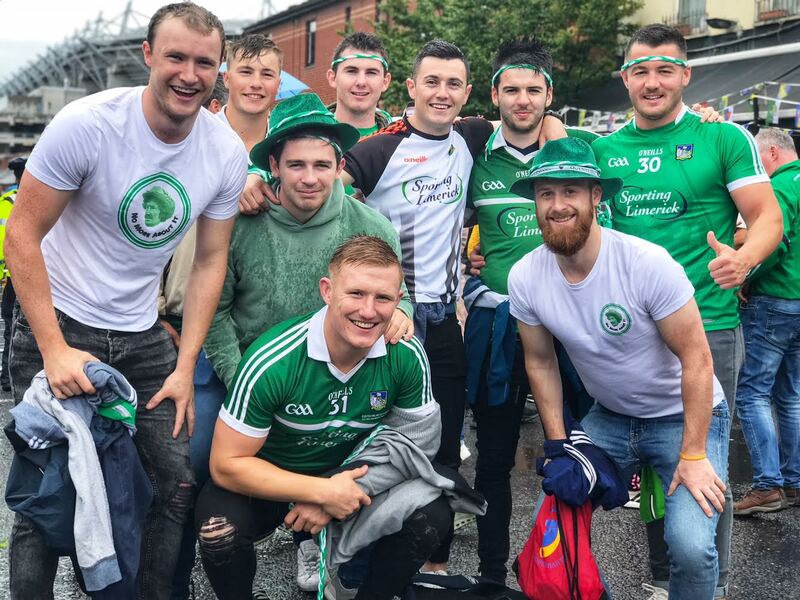 Limerick have won the All-Ireland Hurling Final of 2018. They have won, what many will consider to be the greatest All-Ireland of all time. They are champions. Liam McCarthy is theirs. The roar from the Limerick crowd is deafening. The stand shakes and shudders such is the intensity of their celebrations. The stadium is awash with green. 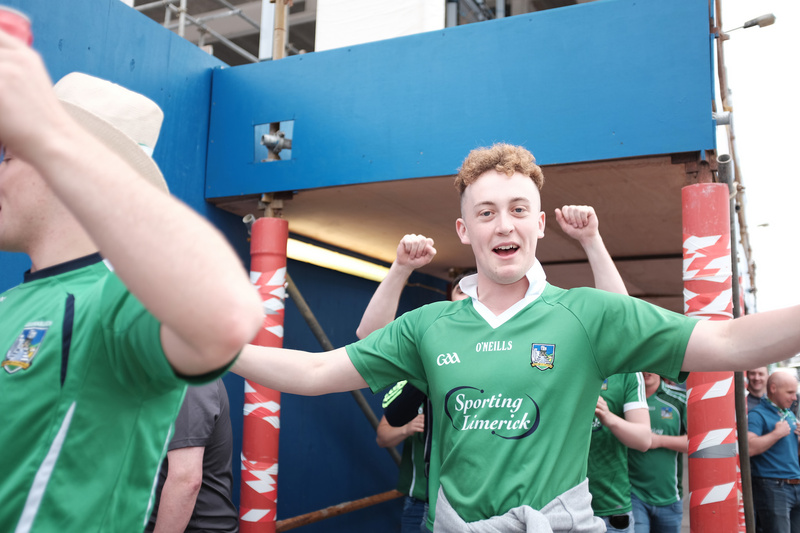 The Limerick supporters surrounding me are hugging each other. Tears of joy running down the faces of men who would have been but boys when their county last won. Down below some supporters burst on to the pitch. 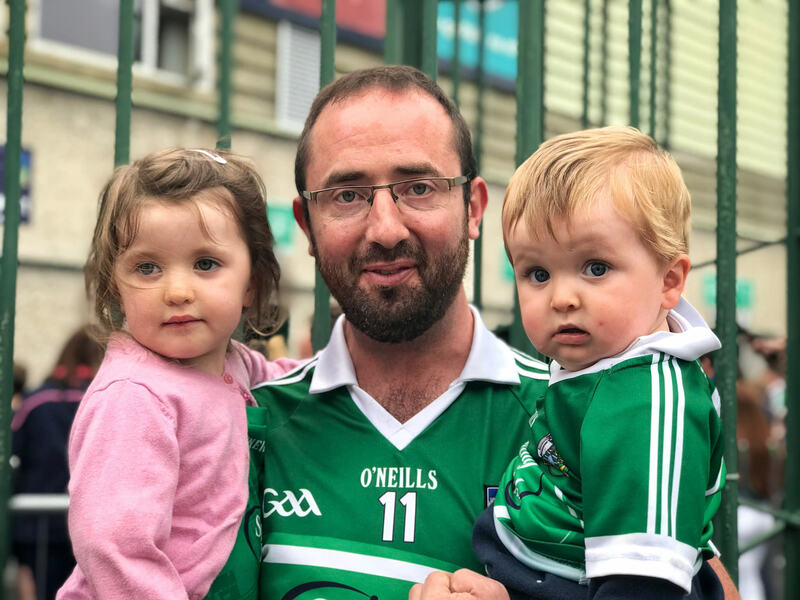 They have waited a generation to see their hurlers win. Now they want to acclaim them on the field. Much has changed since their last win in 1973 and one thing is stewards will not allow fans on the field after the game. They are shepherded back to their seats. 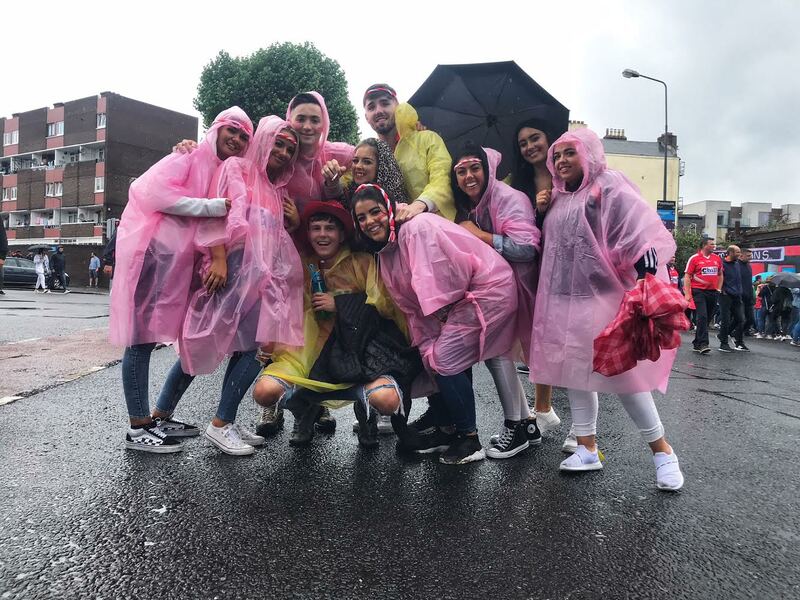 On the big screen and over the loudspeakers John Kiely is interviewed: “”We were always the bridesmaids – but today we got over the line.” On the pitch the players are running from one to another jumping into each other’s arms, hugging tightly. They have done it. They’ve won. 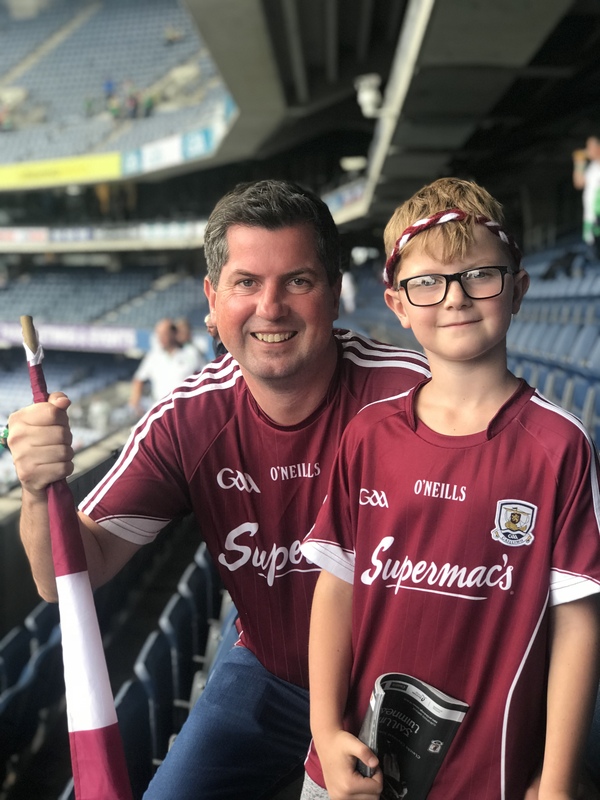 The Cranberries’ song Linger blasts out over Croke Park and the relief of finally getting over the line now seems to turn to joy; to enjoying and savouring this moment. Limerick’s moment. The match was not a classic. What it did have was a classic ending. Limerick were by far the better team, but so easily could have blown it in the end. They went 30 minutes in the second half without scoring a point. They had 20 wides. 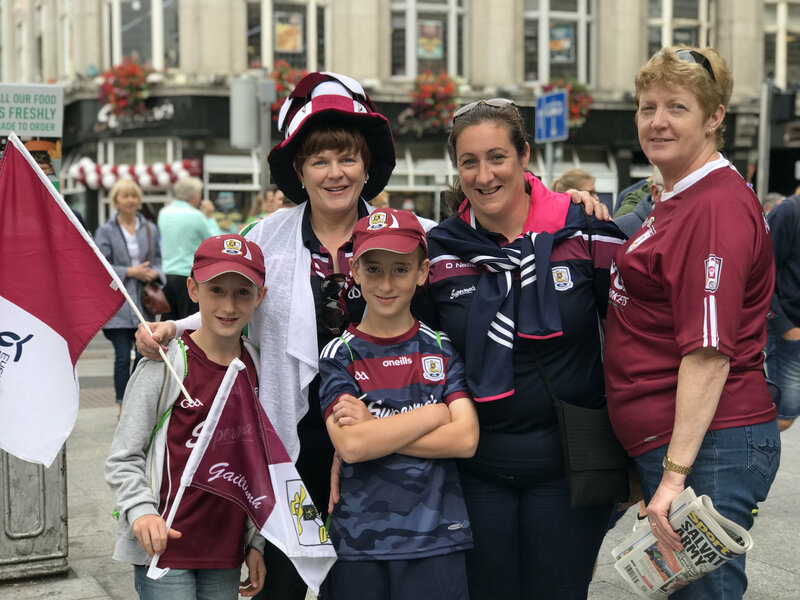 Galway were flat and never looked capable of reaching the standards they had set in matches like the Leinster Final replay and the 2 All-Ireland semi-final against Clare. 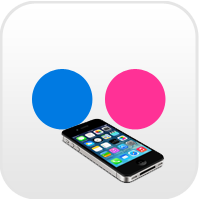 My take on it is this. I feel the new format, while being a great success and giving us some absolutely classic encounters, was one that teams found hard to manage. The players are amateurs. They were asked to play so many high intensity matches at intervals they had no previous experience of. In seasons gone by teams have played as few as 3 games and won All-Irelands. Kilkenny won most of theirs playing 4. Galway played 9 this season. Limerick played 8. 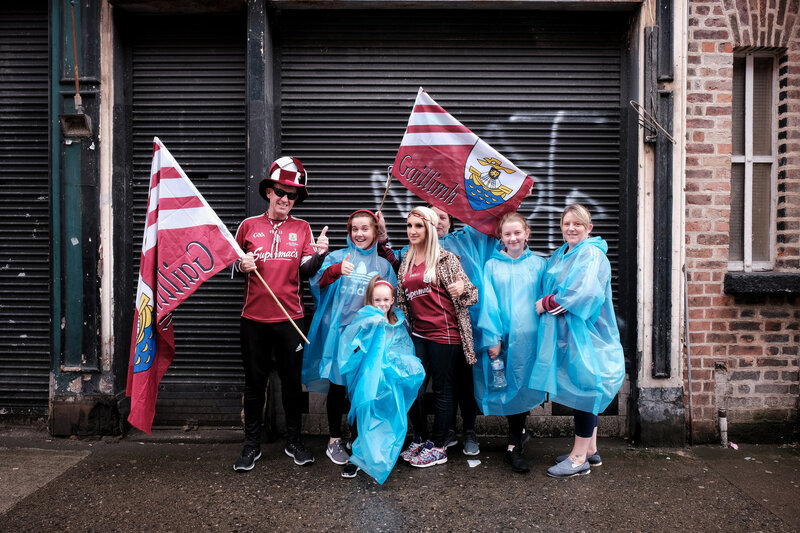 I saw evidence in Galway’s play that they were in decline from the Leinster Final replay. In that first 20 minutes they produced the best hurling of the championship blowing Kilkenny away and racing 9 points up. But in the 2nd half Kilkenny mounted a comeback and got within a point of them. 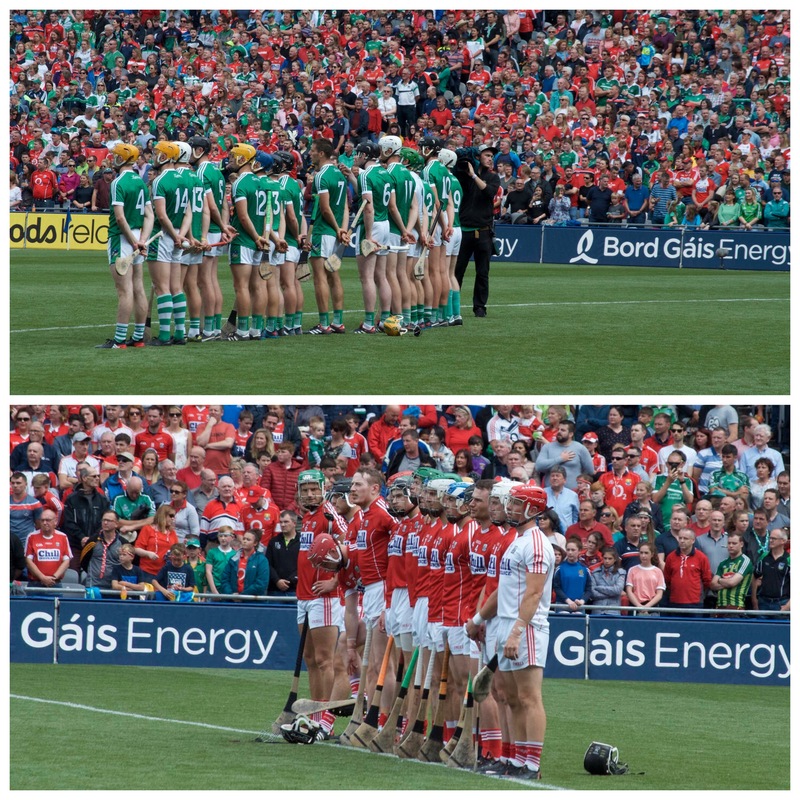 The 2 matches against Clare followed a similar pattern. Galway could not maintain their momentum. The arrived to the final tired. Limerick on the other hand were that bit fresher, but not at their peak. Their score of 3-16 was their lowest of the championship. 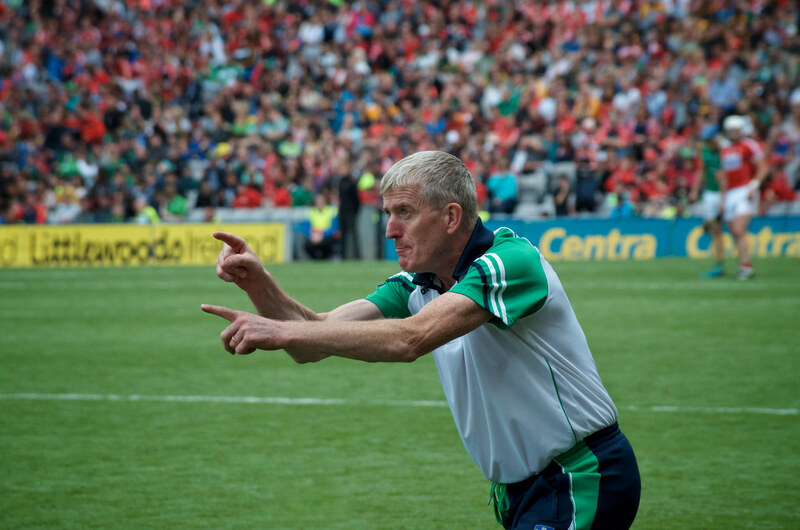 Placing 3rd in the Munster Championship created a path to the final which benefitted Limerick. They had a 3-week break from their defeat to Clare before playing Carlow. 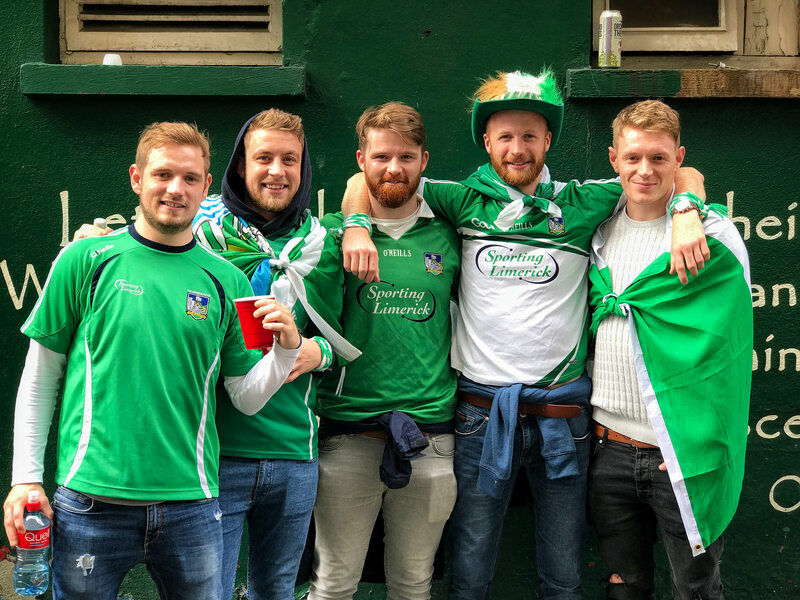 With all respect to Carlow, Limerick’s next real championship game came a week later to a Kilkenny side who would play their 3rd championship match in a row in the space of 2 weeks. 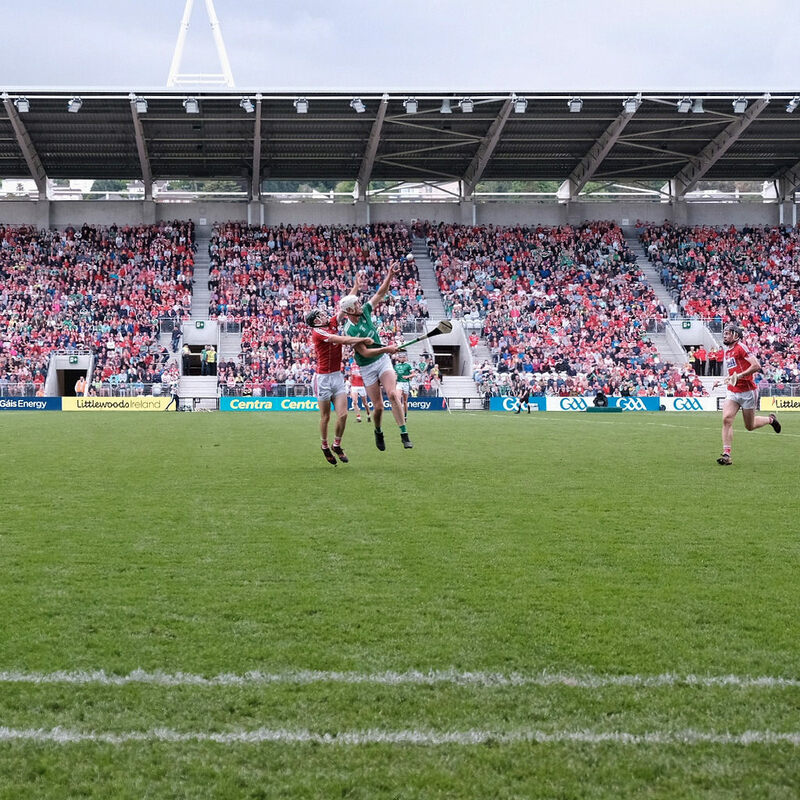 Limerick then had a 2-week break to the semi-final against Cork and another 3 weeks to the final. Yet, while they were clearly the better side on Sunday and clearly the best team of the championship, I felt they were not at their very best in the final. Looking to next year, I think teams and the GAA will have learnt an awful lot from the new format this year. 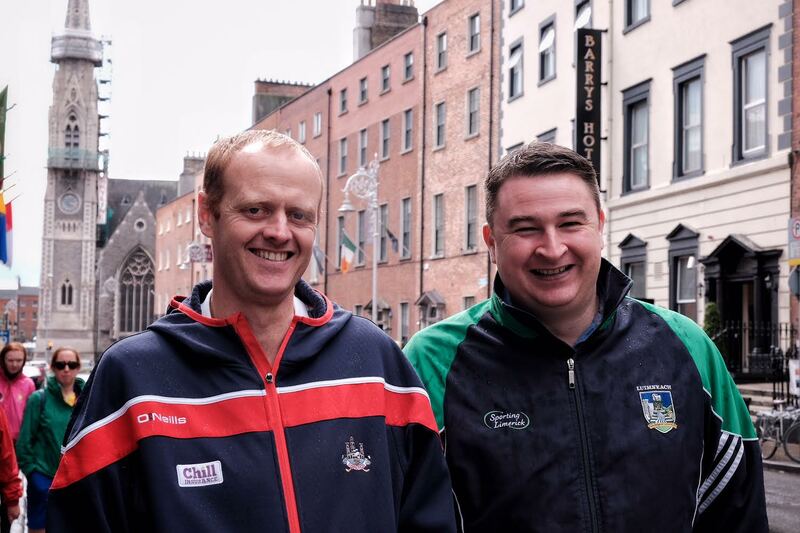 I would imagine the GAA will convene and from this there will be some minor changes to allow all teams a break in the round robin series to ensure no team has to play on 3 consecutive weekends. With no papal visit next year, we will probably see the final being pushed back to the first Sunday in September. 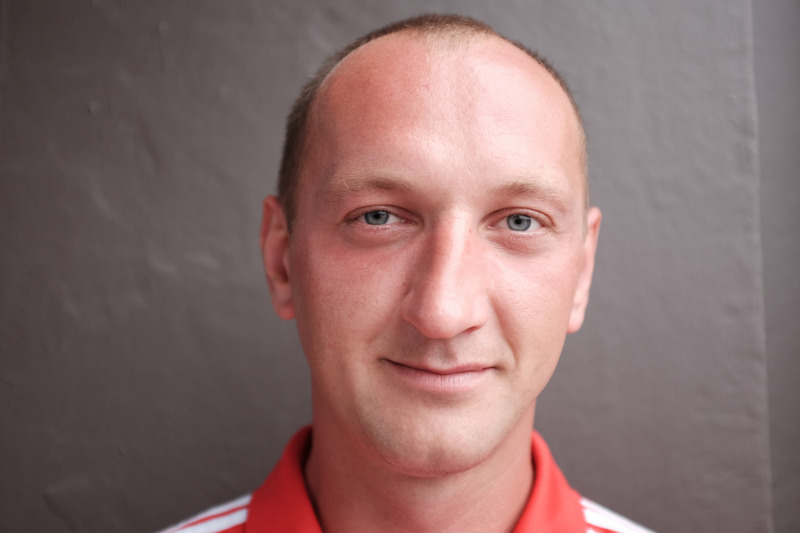 For teams, the challenge will be how to manage players’ fitness and to manage the squad. With the games coming thick and fast it must have been hard to get those who did not make the first 15 to match–day levels of fitness with so little hard training possible with the quick turnaround of games. All-in-all it has been a brilliant season of hurling. 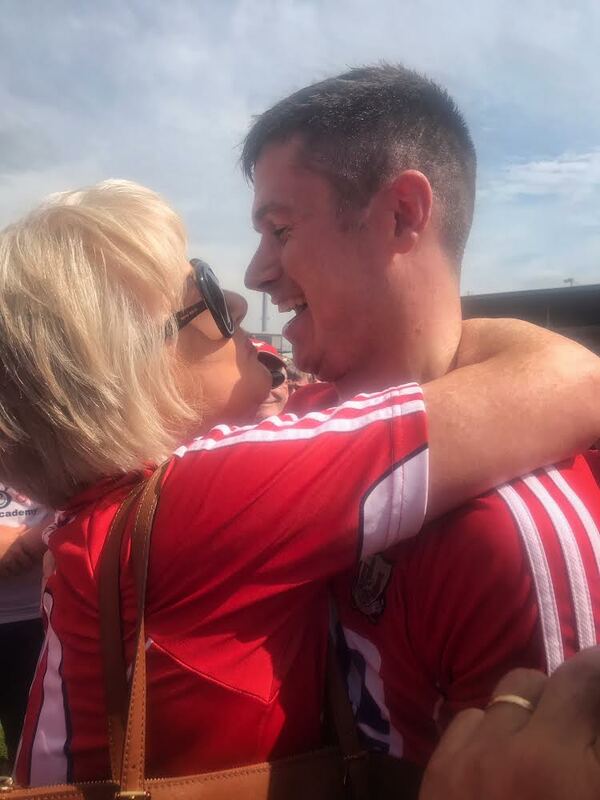 I have loved every moment of it, bar my beloved Cork hurlers losing to Limerick in the semi-final. I got to go to stadiums I have never been to. I saw some classic encounters. 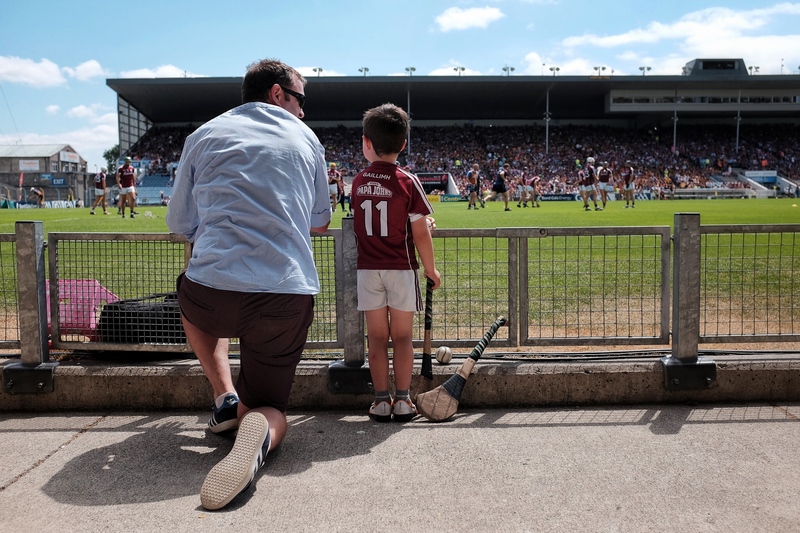 But what I will take away from it all is the sense of pride and identity the sport of hurling brings us. 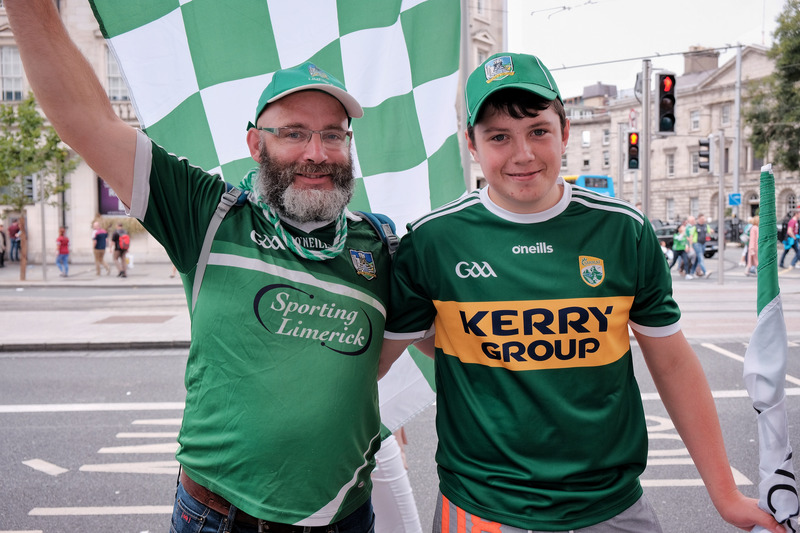 Over the 3 months of the championship I met with hundreds of supporters from all the participating counties and many with no allegiance to any side. I can literally count on one hand the number of people who walked past me or said no when I told them of my project. Invariably I was met with a smile and a warmth. 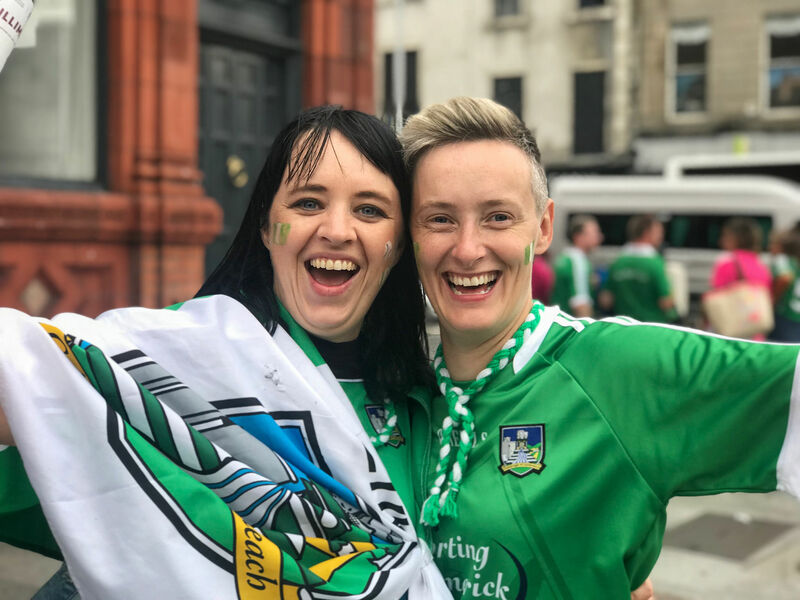 People were quick to gloss over crushing defeats they experienced and tell me of the craic they had with their friends or family on the way to or from the match instead, or they would tell me with hope how this year would be different. I heard many the story of great rivalry, but none of bitter hatred you might get in other sports. 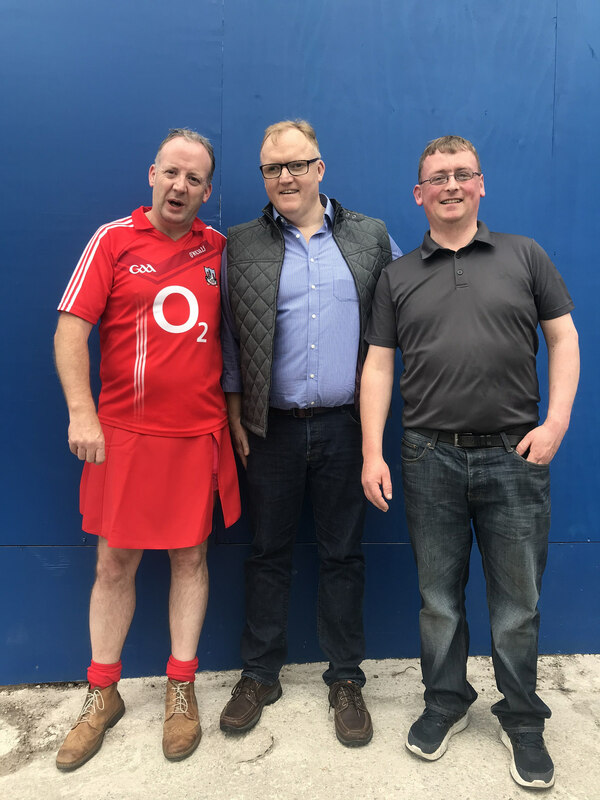 Engaging with them, I have heard their stories and learnt what their county means to them; discovered how hurling lets them live off past glories and dream of ones to come. 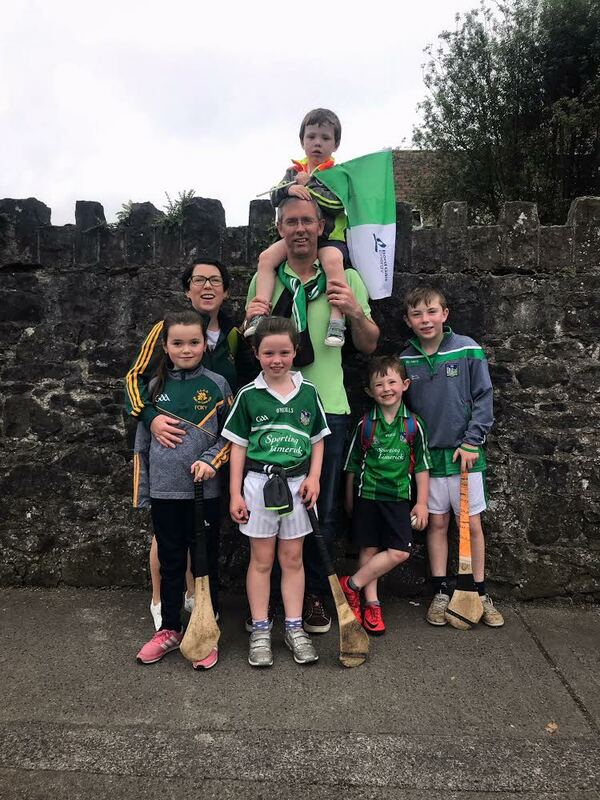 Hurling is something we all share and cherish. 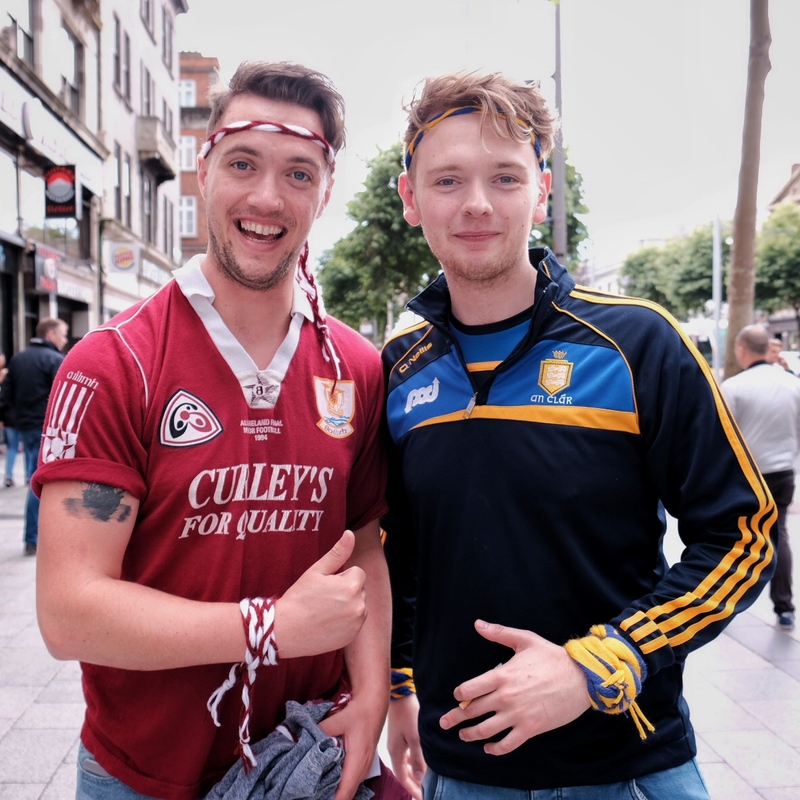 We may be selfish in our dream of glory for our own county, but hurling is all of ours. A national treasure passed down through generations. Its story tells of who we are. 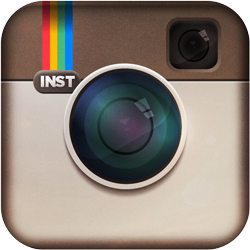 Part 2 – with photos of the fans I met will be posted tomorrow. 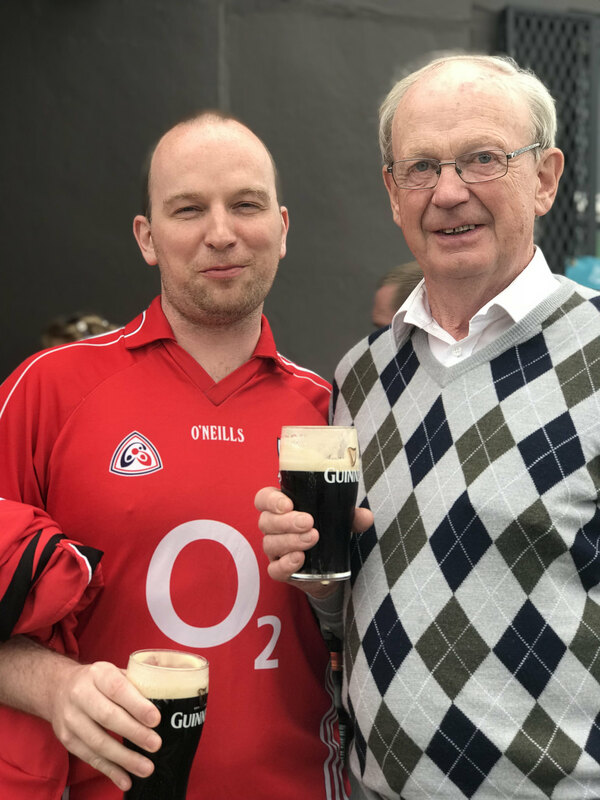 In this hurling season that just keeps on giving and giving, yesterday’s match may not have hit the heights of the two epic games of the previous weekend, but it did try to follow that script. 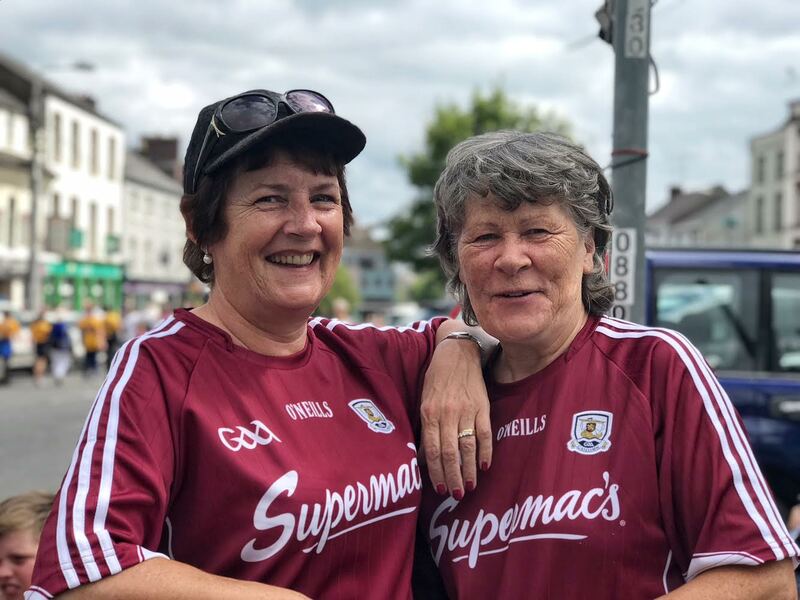 Much like the drawn game between the two counties, Galway raced into a 9 point lead only to see their neighbours gradually claw it back. That is 3 games on the trot where Galway have led by 9, only to see the opposition pull back to within a point of them. But it must be acknowledged that even though they have left big leads slip, they have only been led once in those 3 encounters. 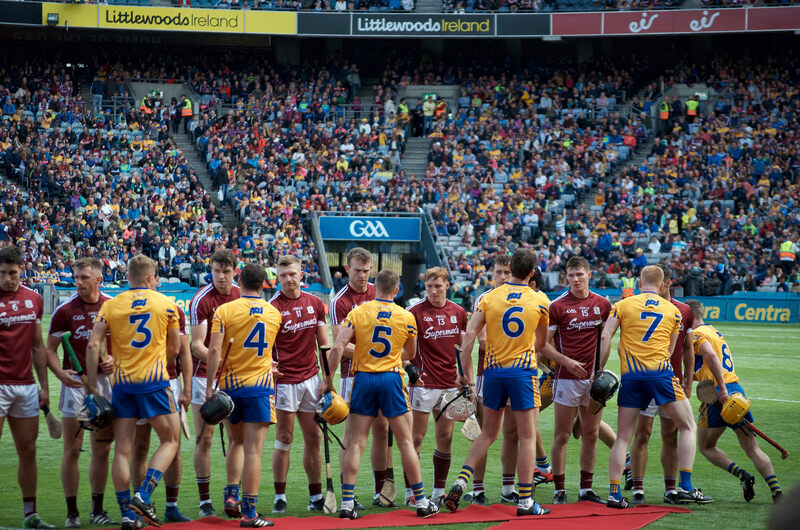 When Johnny Glynn slapped the sliotar one-handed to the Clare net on 20 minutes it looked like Galway had learnt their lesson and would put the game to bed before the half-time whistle. Who could have predicted that they would not score again in the first half? Clare to their credit rallied and again like the match in Croke Park it was Shane O’ Donnell who stood up and led that Clare rally. The teams went in at half-time with 6 points in it. 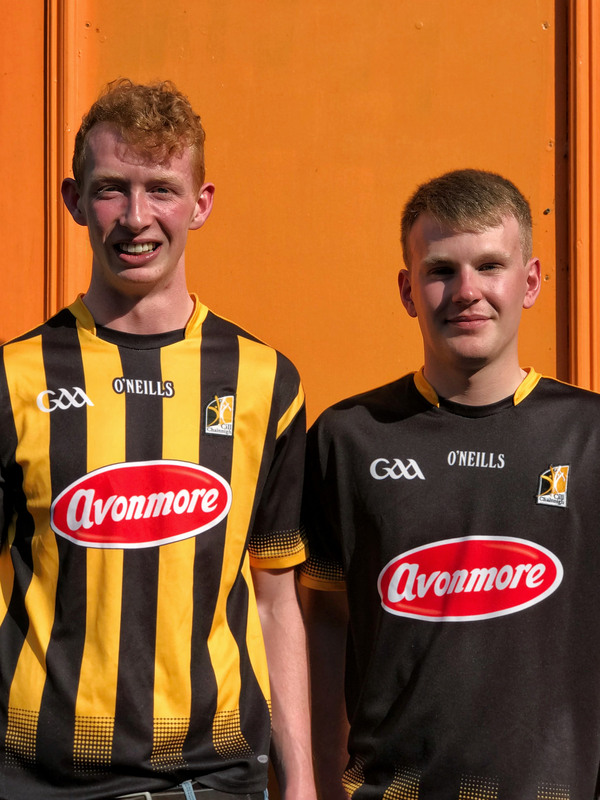 With the help of 2 fine goals from Shane O’ Donnell and Peter Duggan Clare made it a 1-point game by the 54th minute with the score at 1-14 to 2-9. The teams traded points over the next 13 minutes. 67 minutes into this replay and there was a point in it. 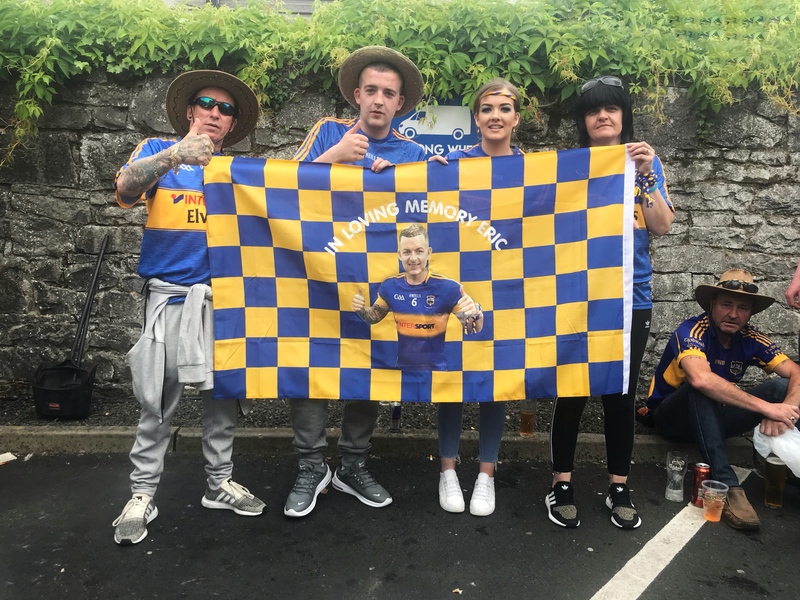 Back in June, at the death of their match against Tipp, the width of the goalpost on the town end of Semple Stadium stood between them and an early championship exit when Tipps’ Jake Morris shot failed to hit the net, bounced off the upright and Clare went up the field and scored a goal of their own. With that momentum they went on to beat and eliminate Tipp and their season opened up for them. 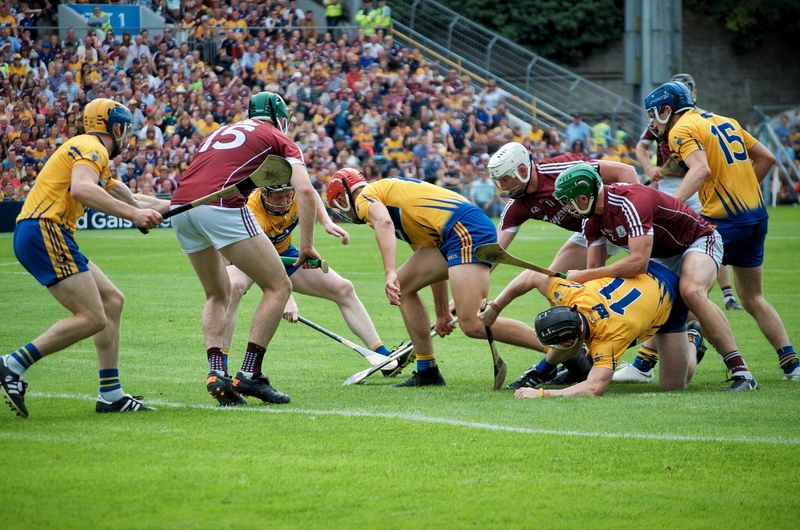 Yesterday, on the opposite end Clare’s Aaron Shanagher had the Galway keeper beaten, but what looked like a simple tap in for him came off the upright and Galway cleared their lines. 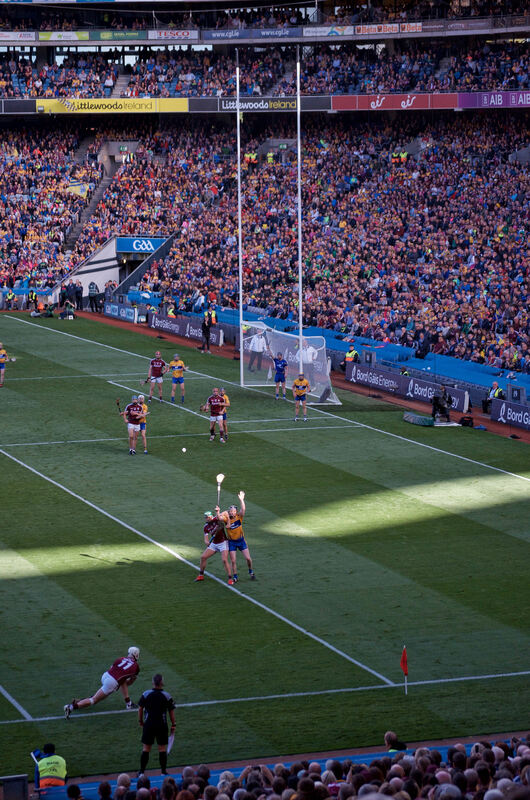 Had it gone to the left of the upright, Clare would have gone 2 points up with 3 minutes left in regulation time. 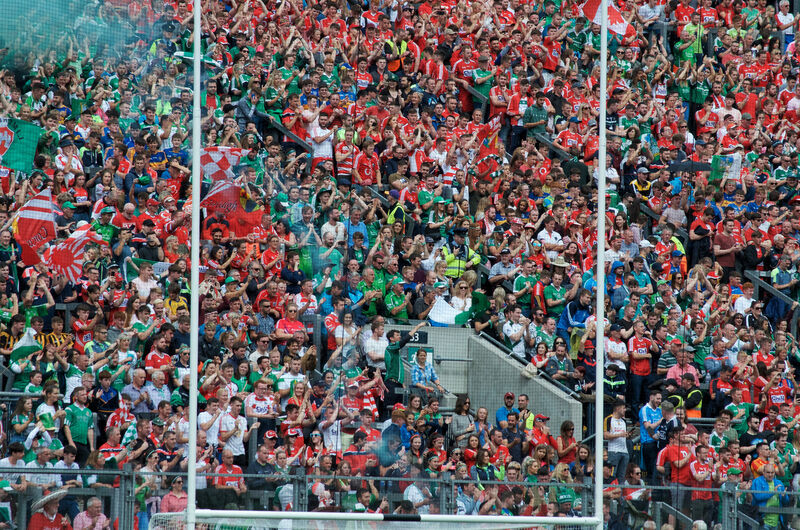 An All-Ireland Final against neighbours Limerick beckoned. 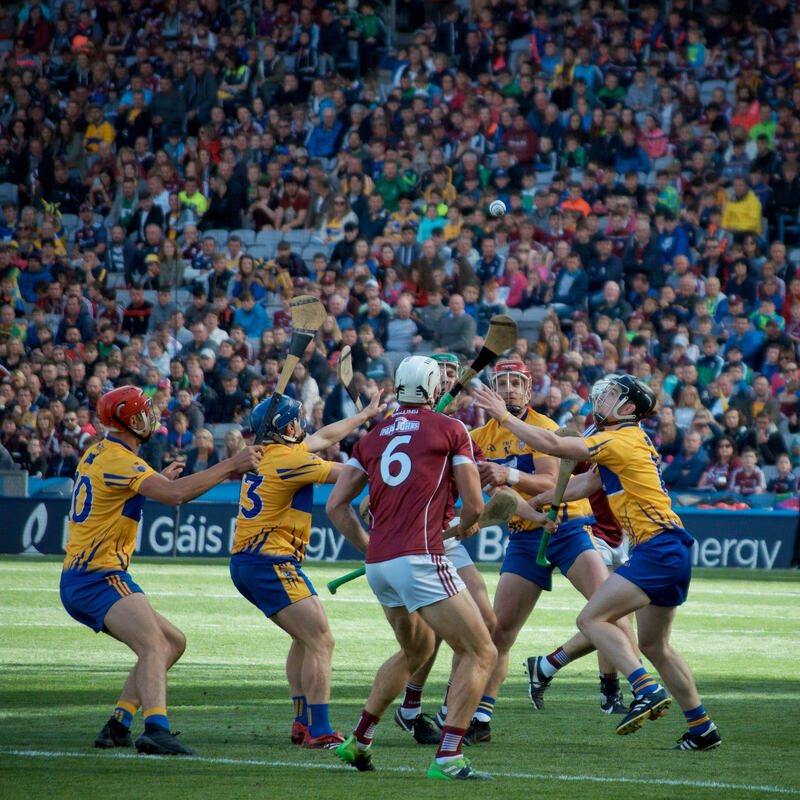 Instead, Galway won a sideline in the Clare half. 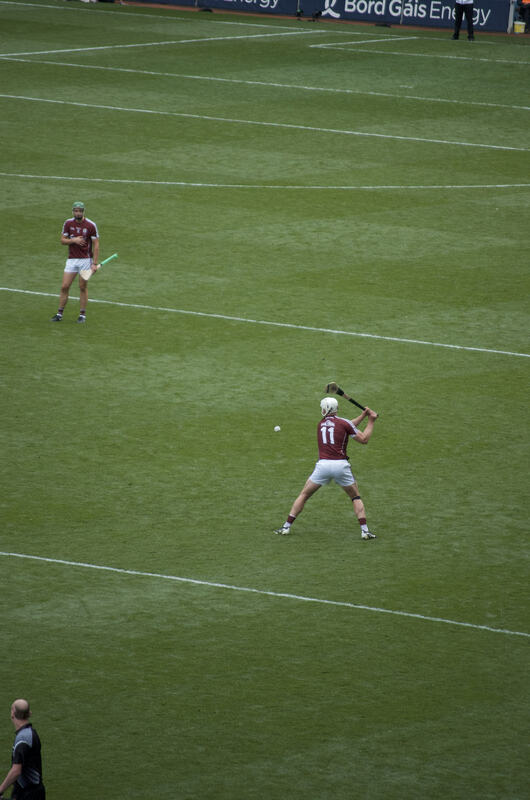 The crowd settled as Joe Canning took his time over the ball. 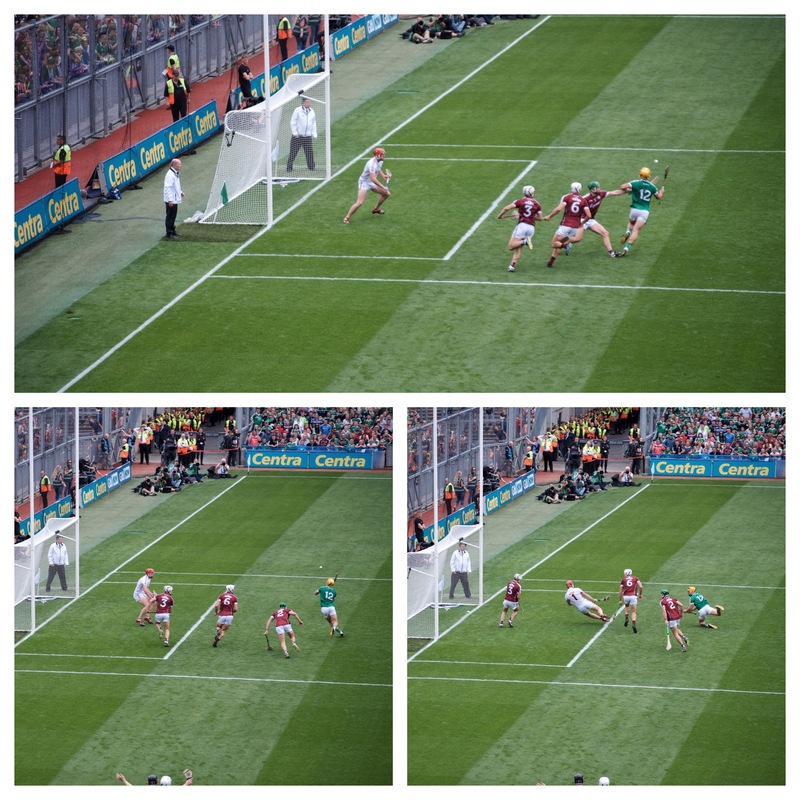 The Galway crowd rose and roared when he sailed the sliotar between the posts. Galway were now 2 points up and only 2 minutes were left to play. 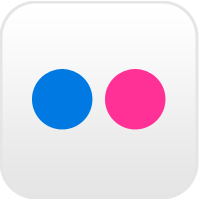 Games are won and lost on small margins. 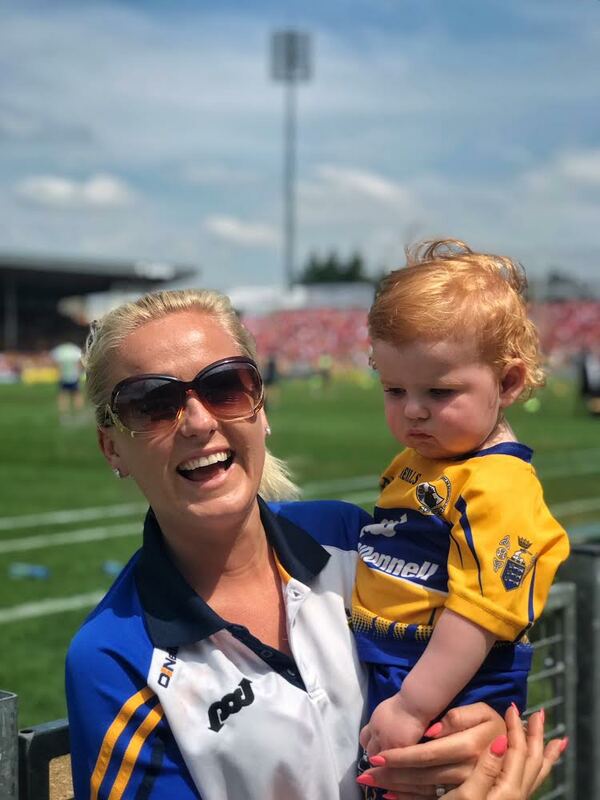 Clare got back to within a point of Galway, but that point was enough to see them through to the August 19th final against Limerick, and the chance to win back-to-back All-Irelands. Clare shot 15 scores, but they also shot 19 wides, some really bad wides. Galway shot 13. Watching from the stand, I felt the 2 teams understandably found it hard to be at their best. 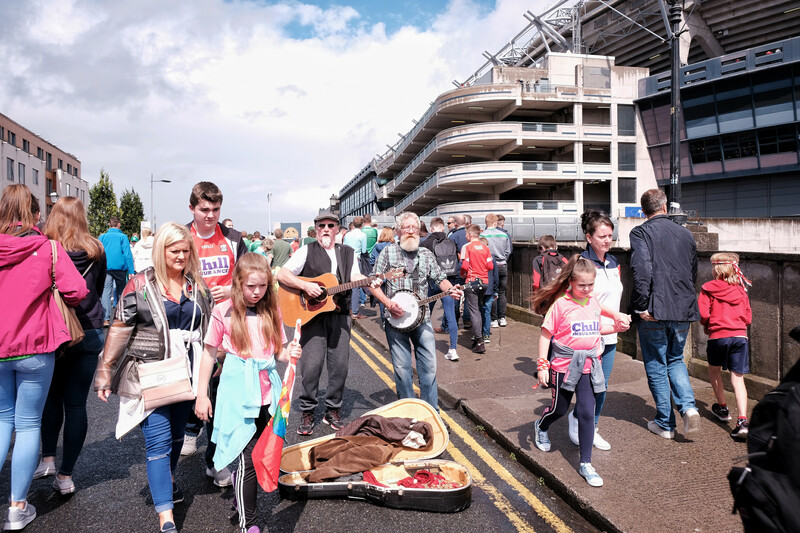 The efforts of 90 plus minutes in Croke Park the previous weekend and the many games both sides have played this summer seemed to take their toll. 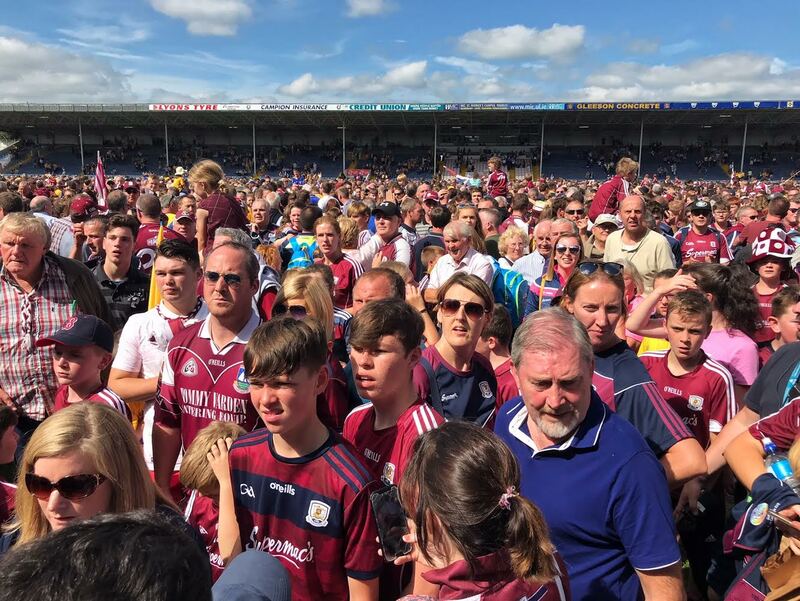 In fact Galway’s scoreline of 1-17 would not have been a winning scoreline in any of the 23 championship games played except for the drawn Leinster Final between themselves and Kilkenny. It has been a long season. 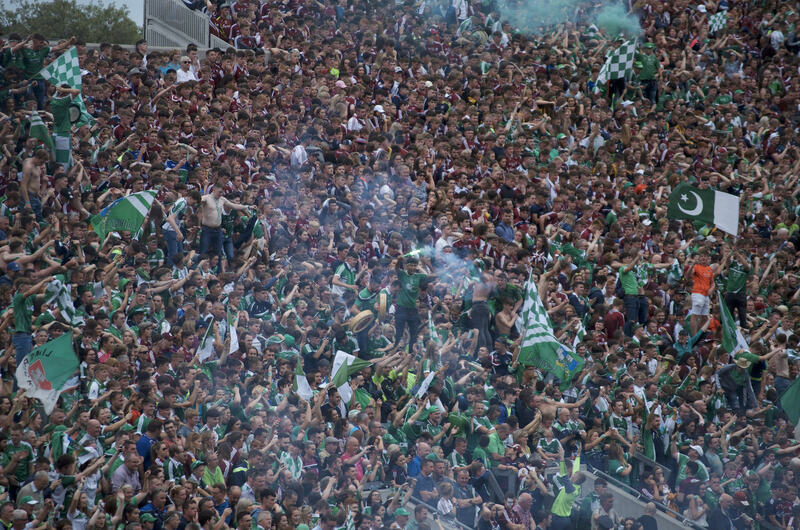 Both Limerick and Galway will play their 9th game of the championship season in the All-Ireland Final. Let’s hope they have time to recuperate and deliver us the match this championship season deserves. 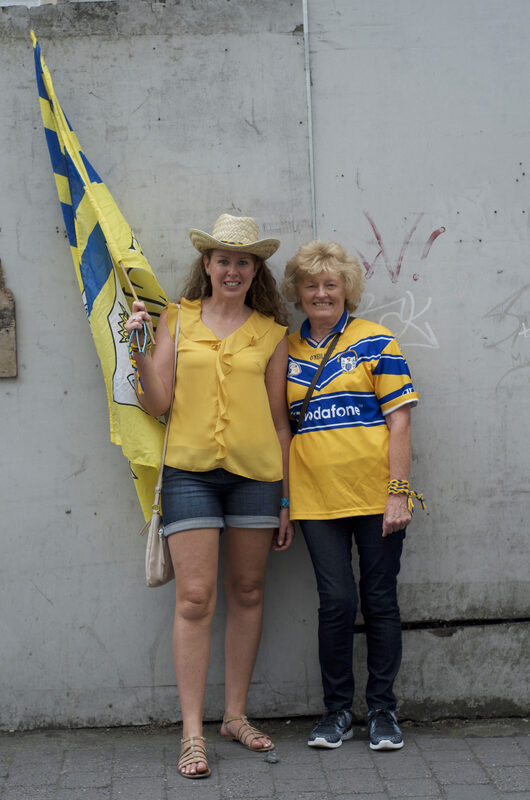 I find it hard to imagine regular day-to-day life going on in Thurles. Does it really? The town seems to be purposely designed for big match days. 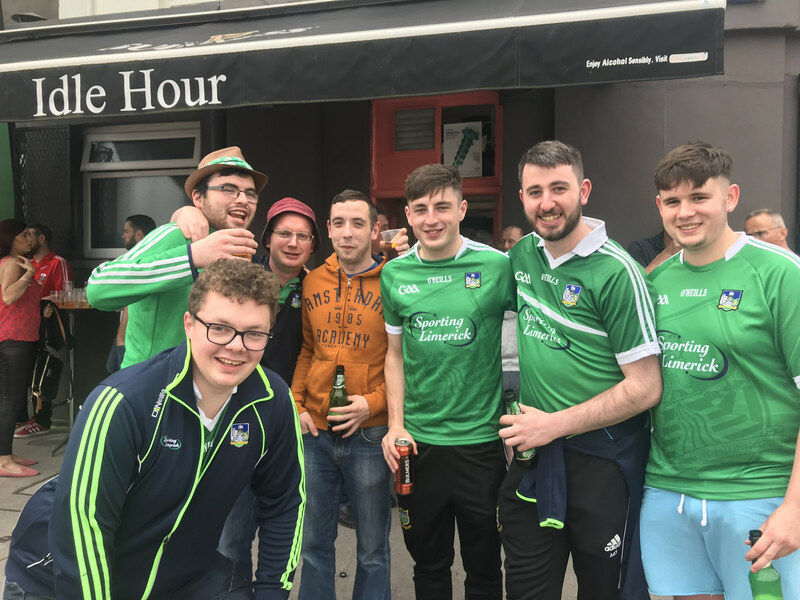 Walking into Thurles town square seeing the colours of the two teams playing on that day, hearing the banter being hurled back and forth from opposing supporters and sensing the anticipation of the untold theatre that is in store is something magical. 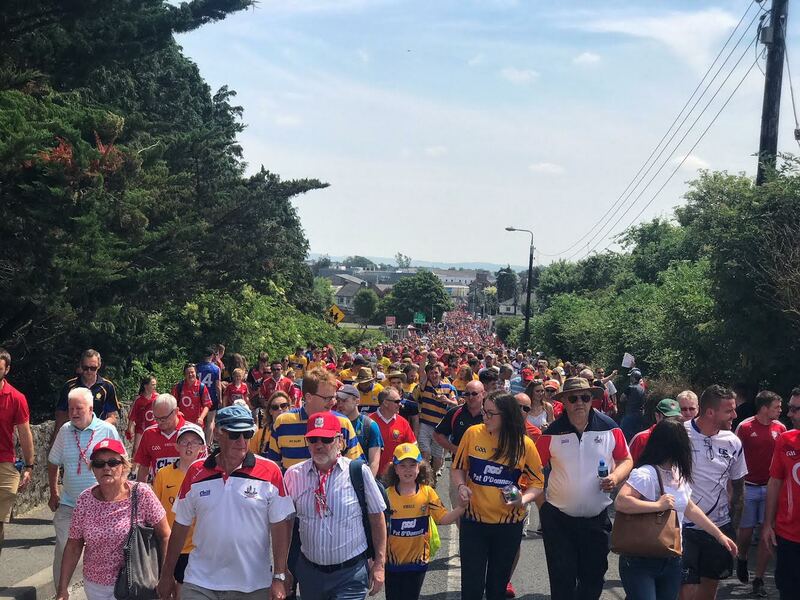 Then when time has been calculated to arrive in time for the teams running out, the procession out of the square, up the hill over the railway bridge and the turn right for Semple Stadium begins. Then the real excitement starts. The stadium comes into sight. A roar from the crowd inside heralds a score in a minor match and the pace picks up. Through the barriers and you see it. 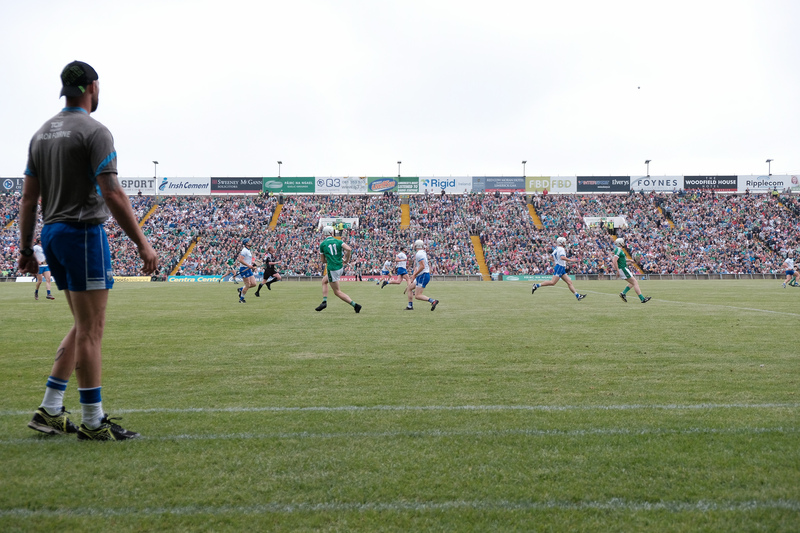 Semple Stadium; Field of Legends. The queues of people making their way through the turnstiles. Tickets ready to be scanned. Little kids with their hurleys. Their fathers telling them to keep the sliotar in their hands now. The darkness of the turnstile and then the light. You’re in. You’re here. Thurles. Nothing like it. There are many GAA traditions. 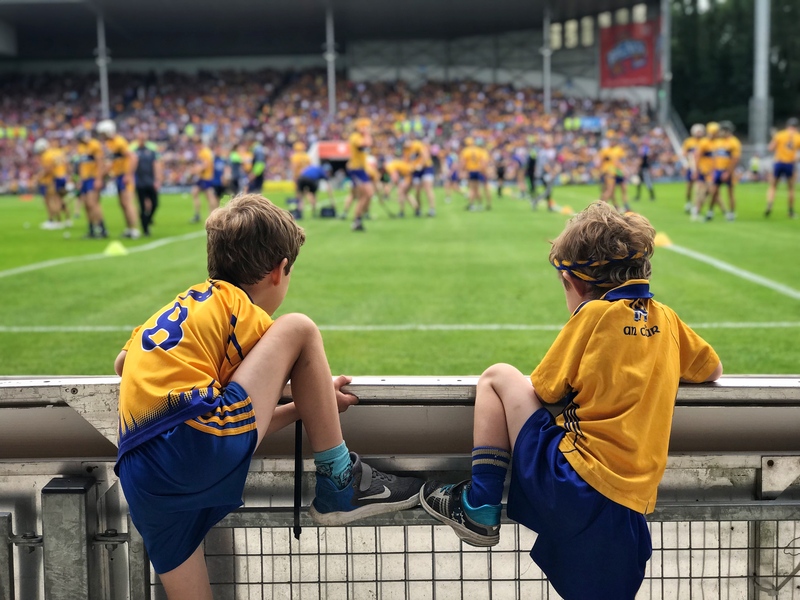 One I love is that in Semple Stadium they allow the fans on to the pitch after the game. 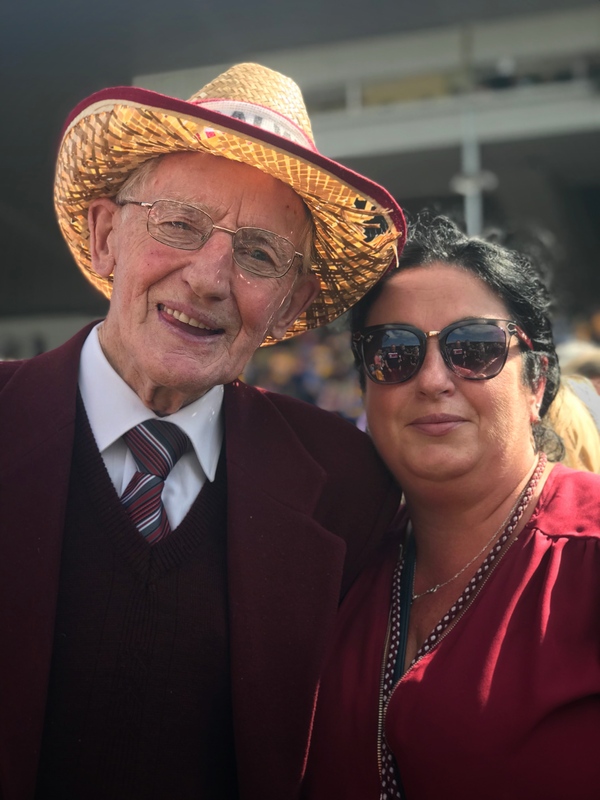 I met Frank O’ Dowd on the pitch in Thurles after the final whistle.91 years old and still wants to get up off his seat at the end of the game and greet his heroes on the field. Frank never misses a match. 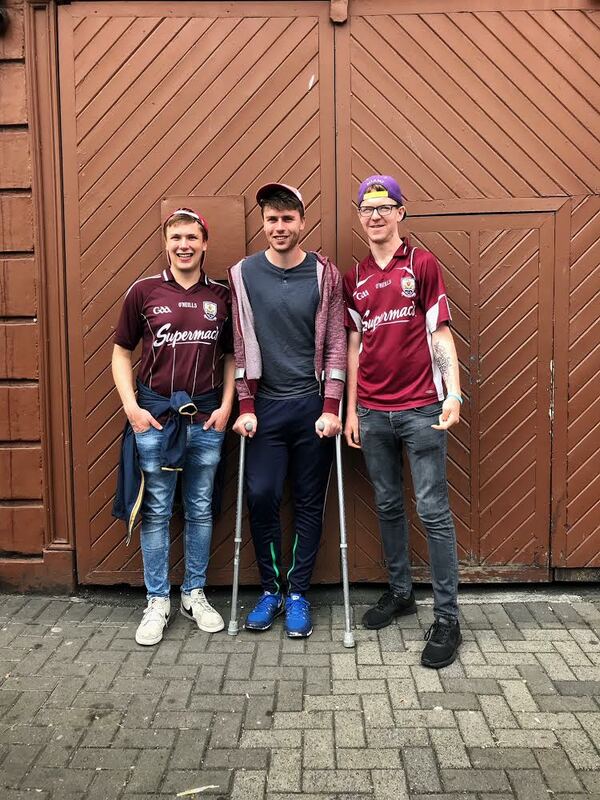 Not just Galway hurlers – their footballers too. And minors. And club. And he loves horse racing. And he does it all with his family. His wife, Phil, could not be with him as she was in hospital in Dublin. 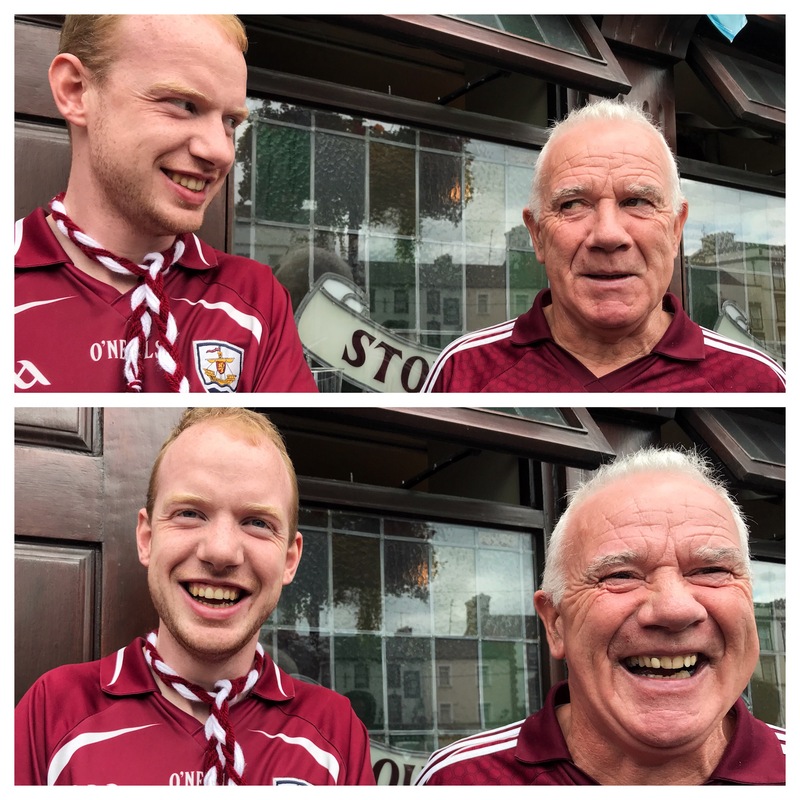 His daughter, Áine, showed me a photo of her in her Galway jersey watching the game. 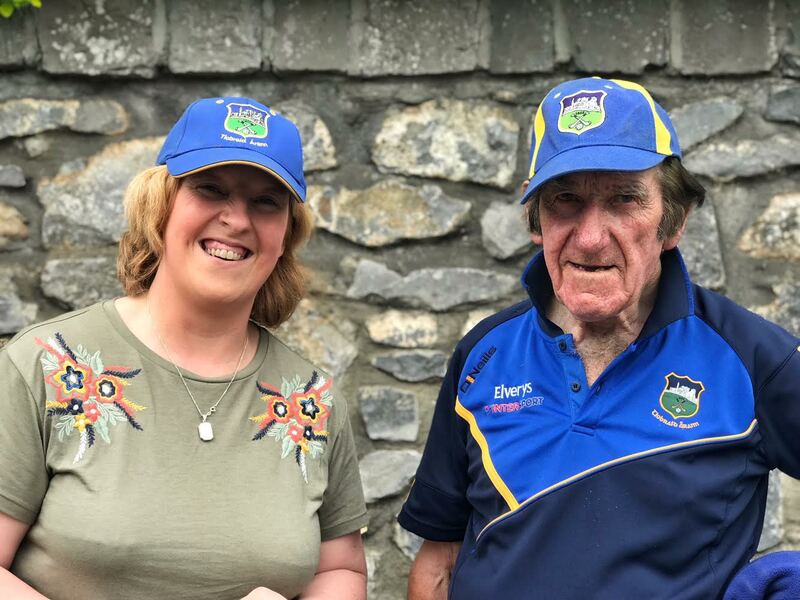 The GAA should honour Frank and his wife Phil. They are everything good about our games. “God, that’s some commitment to the cause.” I said. What happened to you? I was going up for a ball last night. Came down without the ball and did this to my leg. 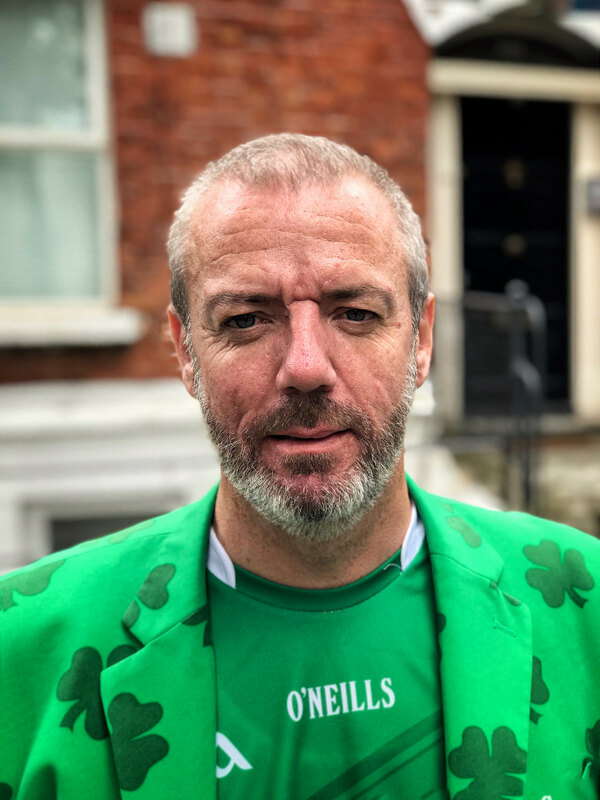 Kevin McDonnell from Galway told me. Fair play to you for coming. I wouldn’t miss it for the world. Tell me what is special about going to the games with your brother, with family. I asked. Well, I’ll put it this way. You know those awkward moments at matches? Awkward moments? Ya, like when your team scores a goal and you grab the fella next to him and start hugging him. Well when the excitement dies down and you see it’s your brother you’ve been hugging you’re grand. No awkward moment! No random stranger you’ve been hugging. “This is our bonding time. No men. 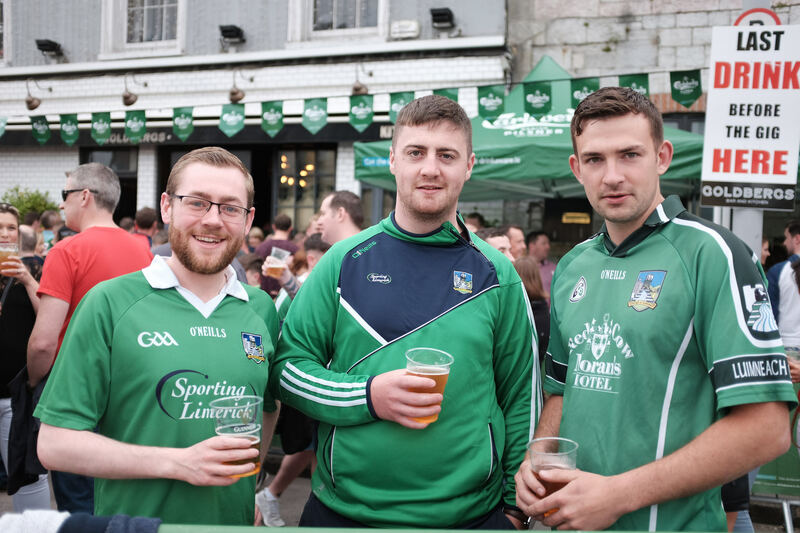 Sure both our husbands are from Offaly and what would they know? We leave them at home and enjoy the day out together. We wouldn’t have it any other way. We’ve been going to matches together since the 70s. Mary O’ Callaghan told me. Here she is with her good friend Anne McCarthy. “I do, I do. 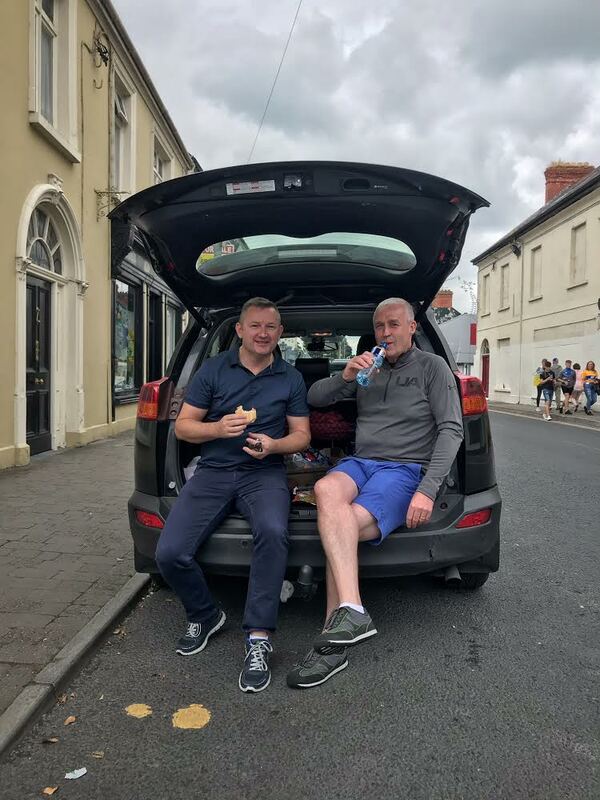 The first match I brought him to was the ’98 All-Ireland Football Final against Kildare. He was 5. I told him to stay next to me. I told him. Do you think he did? Course not. I lost him. Public announcement. Got him back. Still have him!” Gerry Burke told me about his son Darren. 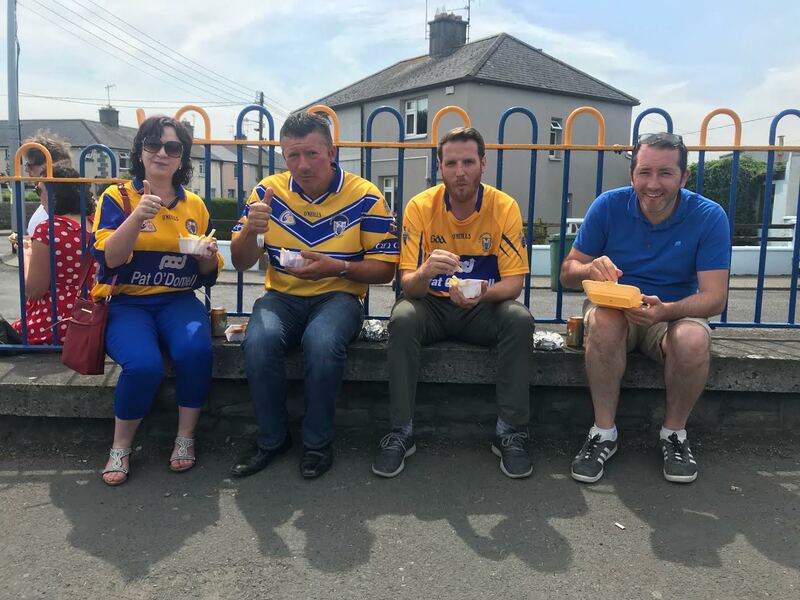 “So you’re from Ballyboffey, living in Florida but home on holidays and here in Thurles supporting Clare? I asked Marcus Griffin. 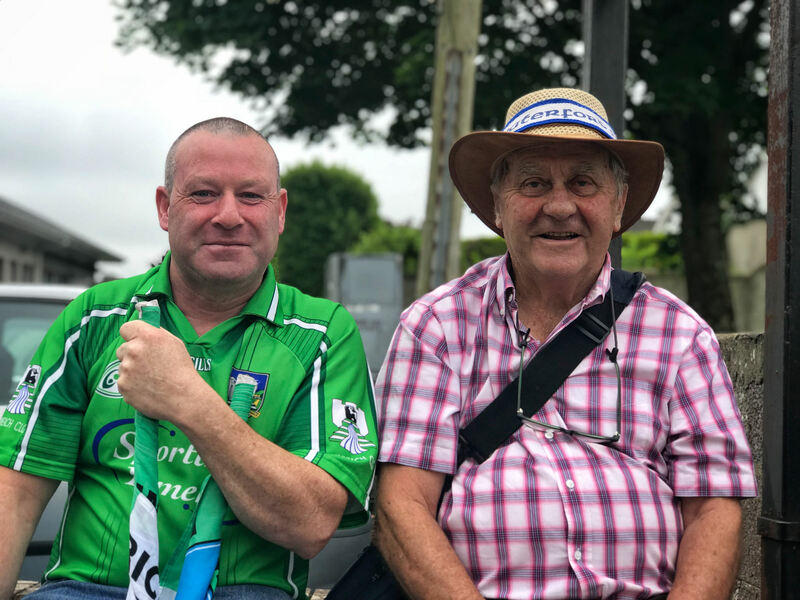 “Ya, come to think of it, I really should be in Ballyboffey supporting the footballers today, but it’s great to meet up with Thomas and see some hurling. 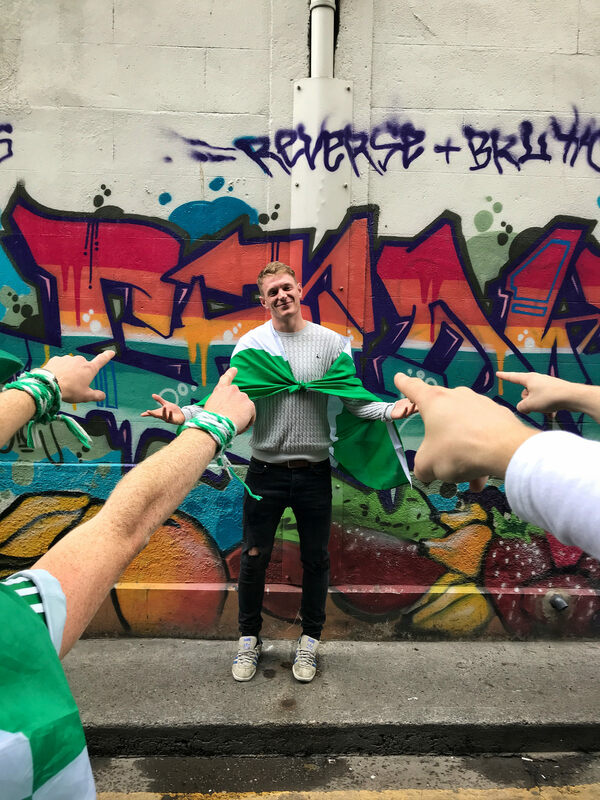 “And you’re a Tipp man, Thomas? 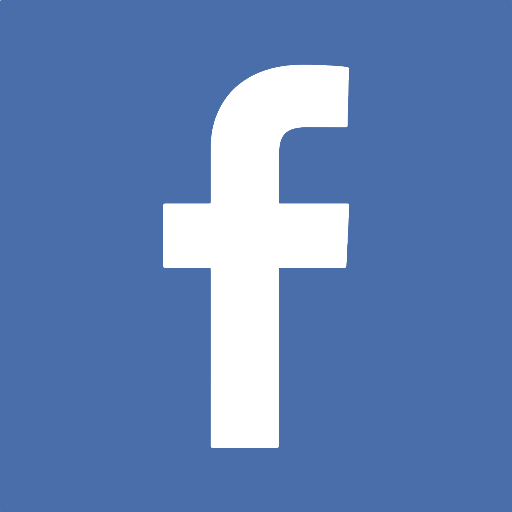 How come you’re supporting the Banner today? “We are both married to Clare women. There’d be hell to pay if we didn’t! “Ah, we do enjoy it, but Mam gives out to me for getting too excited. But who wouldn’t? Yvonne Connellan told me. “What was the best day? The best day is yet to come. Maybe today or in two weeks’ time.” Phil told me. “Can I get a photo, Tommy? “Sure, he says and comes to put his arm around my shoulder. “Not a selfie! I said. A photo of you.” “Sure, grand!” he says. 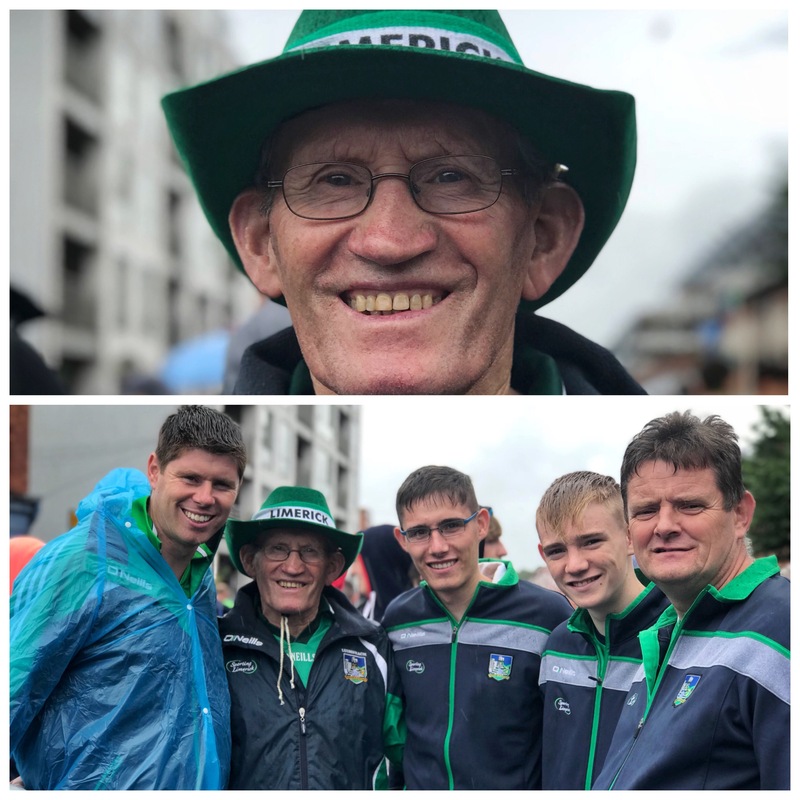 “What’s a Meath man doing at a hurling match? I asked. 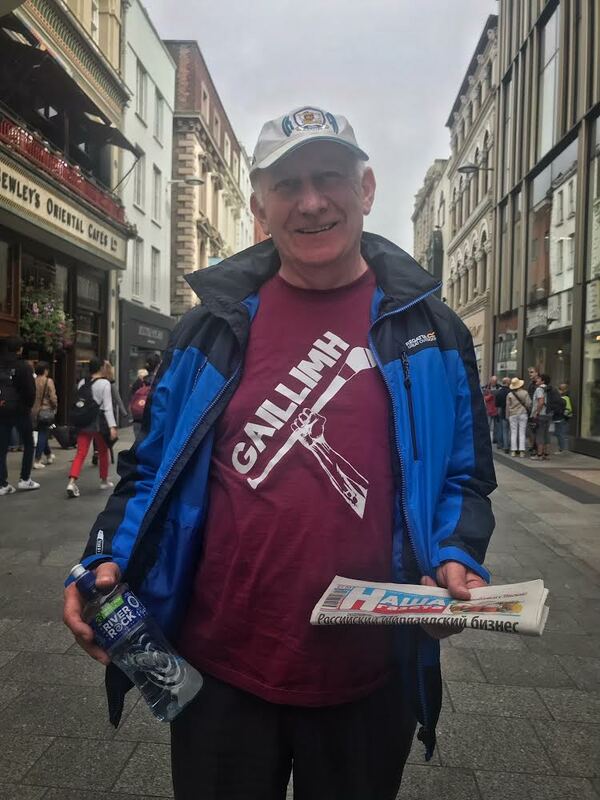 “Galway for the shmall ball.” He says. 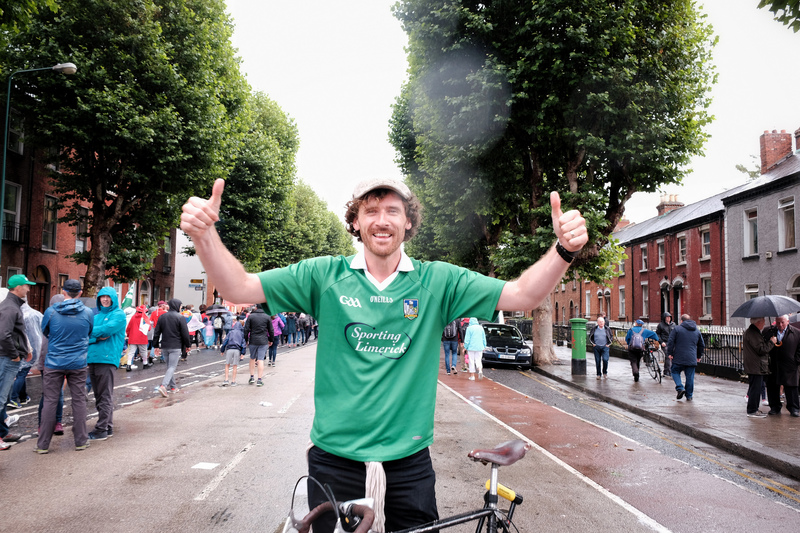 And so we are down to two teams – Limerick and Galway. 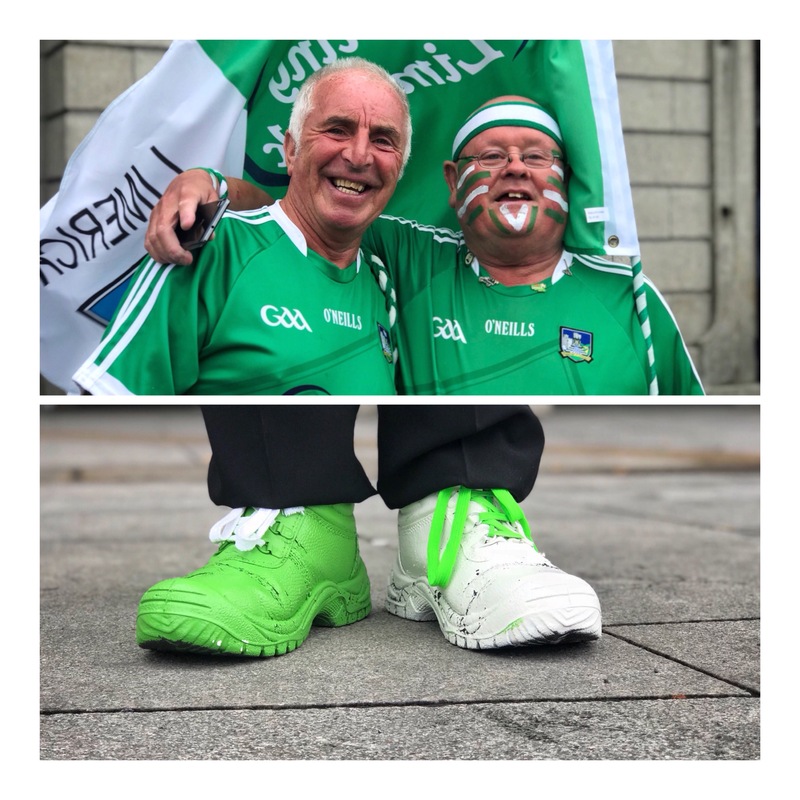 Down to one match – The All-Ireland Final of 2018. It has been an epic season and the most wonderful journey for me. I have met some wonderful people and you know I will be happy for either team to win it knowing the passion the supporters bring to the game and what it means to them all. 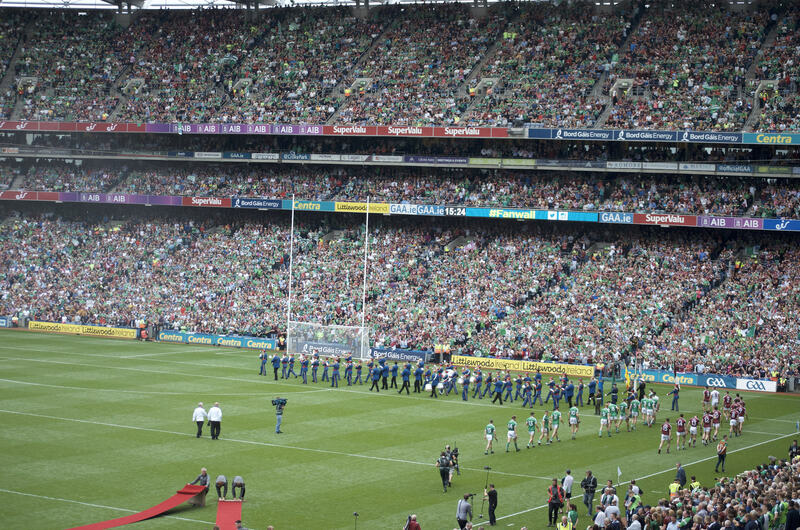 I am really looking forward to Croke Park on Sunday, August 19th. Here’s to another classic. Here’s to hurling. The heart of hurling! Everything about Kilkenny tells you you are in a hurling town. Shop windows are given over to full displays of Kilkenny hurling paraphernalia. The famous black and amber jersey of the cats is seen everywhere. There are even houses painted in the team’s colours. 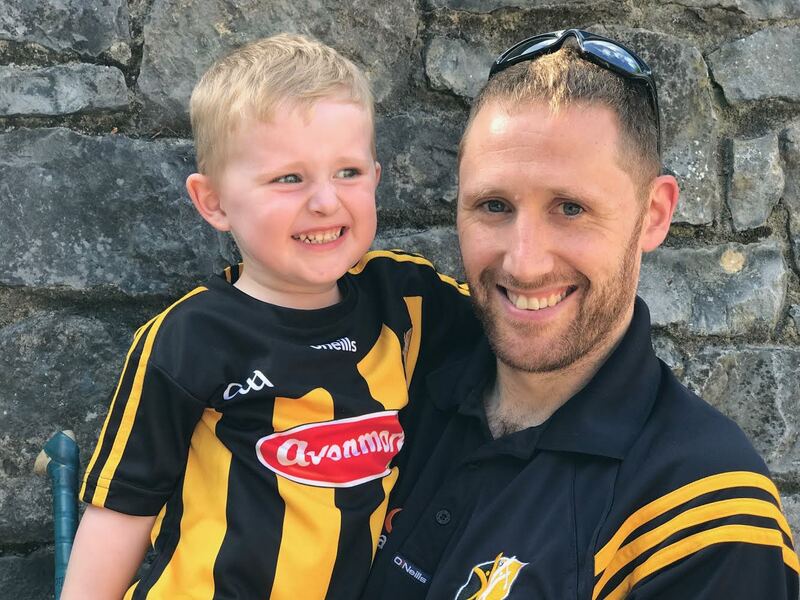 There is an air of excitement before the big championship clash with neighbours Wexford; a confidence that only Kilkenny fans can have. Sure, their team is not the great team of 2006 to 2015, but this is Kilkenny. They know how to win hurling matches. Again they won. Again they won when the odds seemed stacked against them. 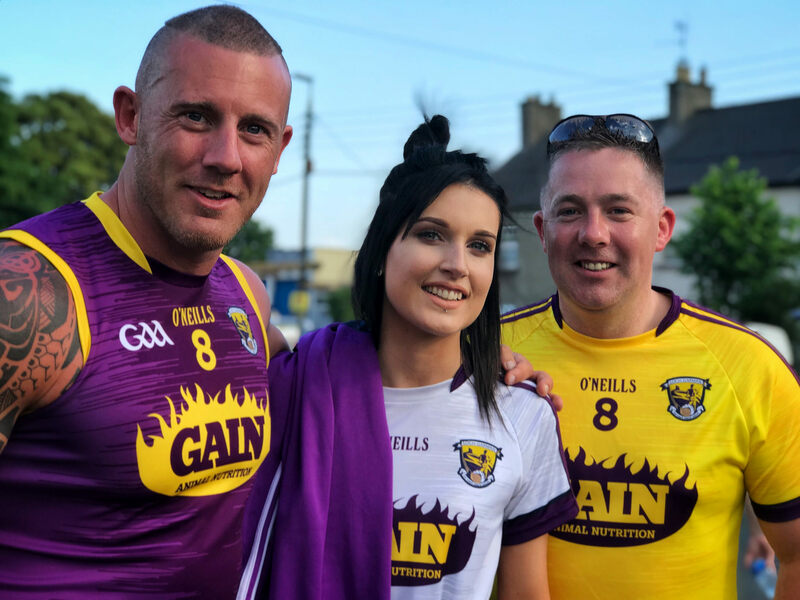 Wexford were at one stage nine points to the good. Kilkenny looked like they were going to suffer consecutive championship losses to their great rivals. 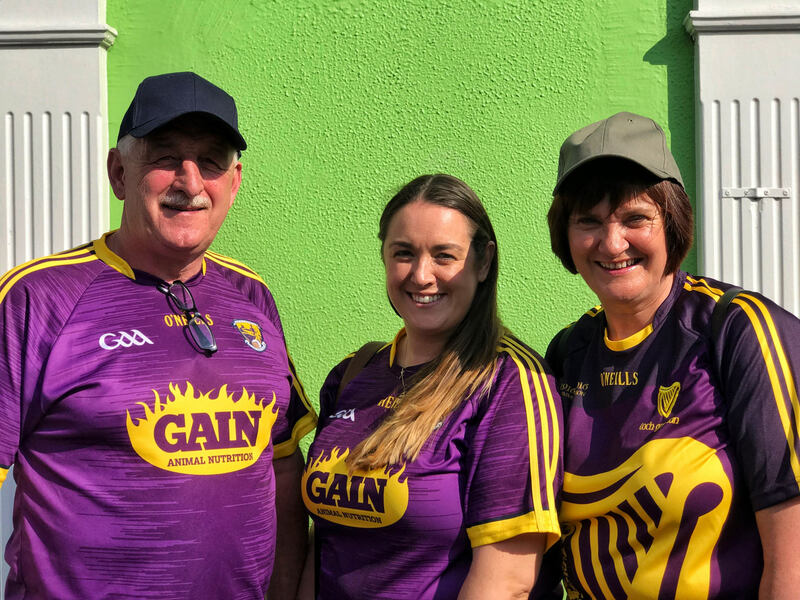 Aided by the home support in Nowlan Park they rallied and hit Wexford for 15 points in the second half to win by a single point. 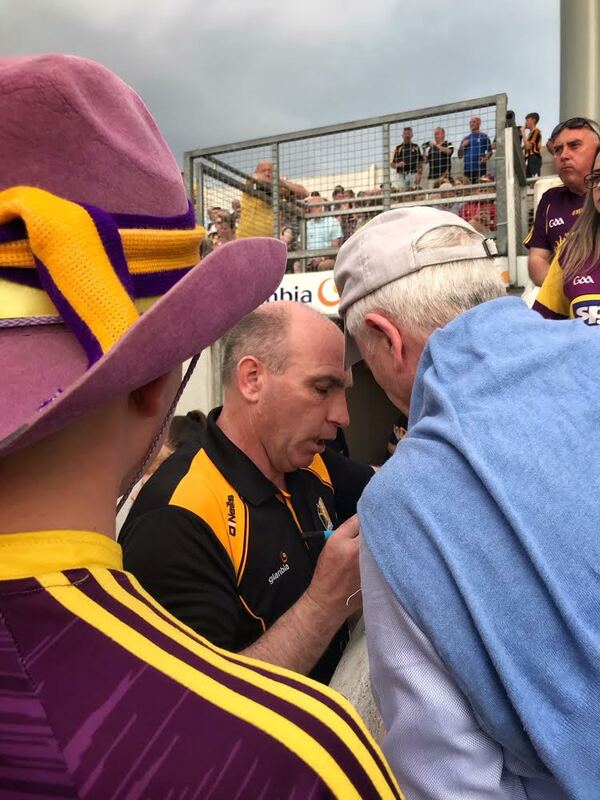 Wexford had led going in at half-time by 6 but the toll of 4 games in 21 days took its toll as they tired in the second half. Davy Fitz pointed to this and claimed his Wexford team did not deserve to lose. Maybe so, but you cannot discredit Kilkenny. They know how to navigate tight games. They know they have it in them to stay the course of the battle and more often than not they come out on top. 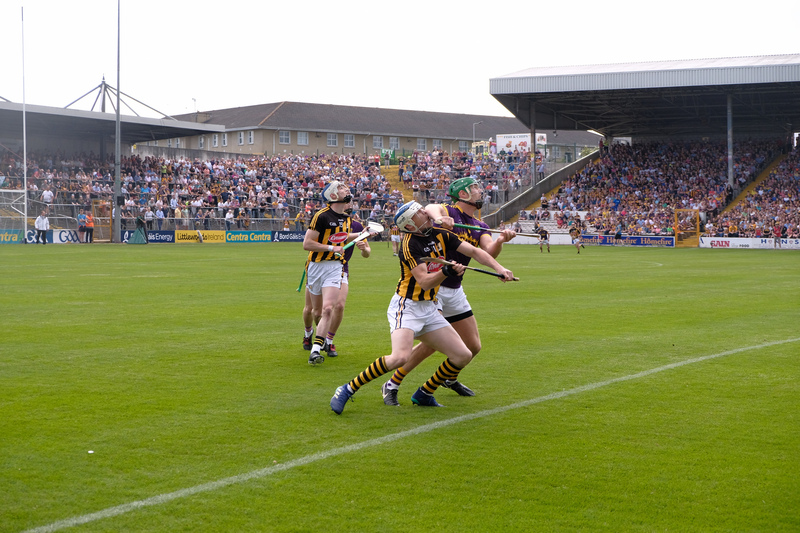 Kilkenny move on to meet Galway in Croke Park in the Leinster decider on July 1st. Wexford will meet the runners up in the Joe McDonagh cup a week later. Wexford were the last team for me to see in this championship. 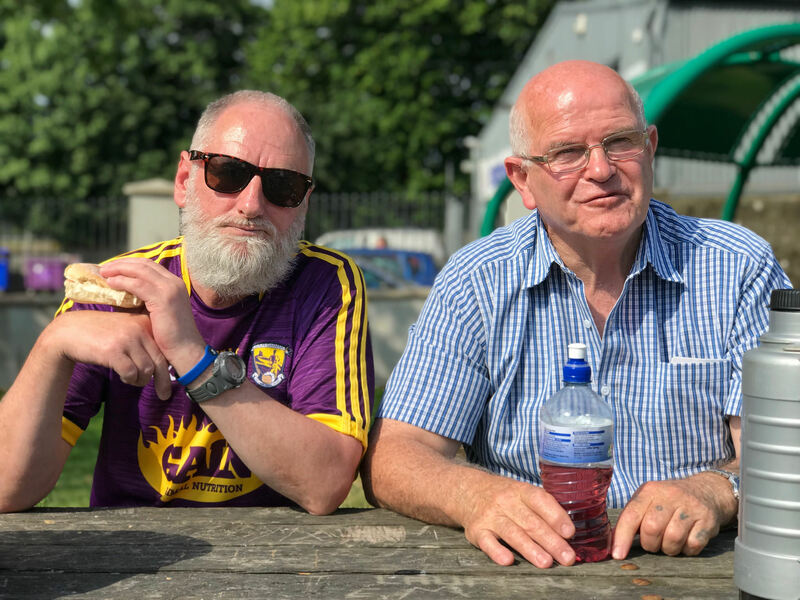 I met two Wexford fans, Nickey Cash and Mick Roche, two men married to two sisters, sitting in a playground having a bit of a picnic before they headed into the game. The two have been going to games together for years. 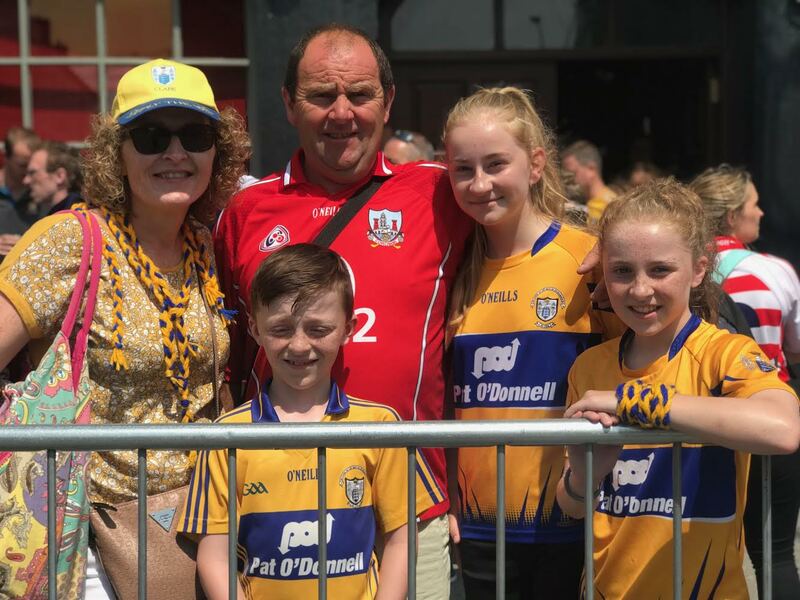 Usually they are part of a larger group but the rest of family were at a wedding, but they couldn’t miss the clash with Kilkenny. Nickey told me a great story. In 1957, just a 1 year-old little baby, his parents brought him to Croke Park to see Wexford take on Tipperary. “Who won?” I asked. Tipp did. 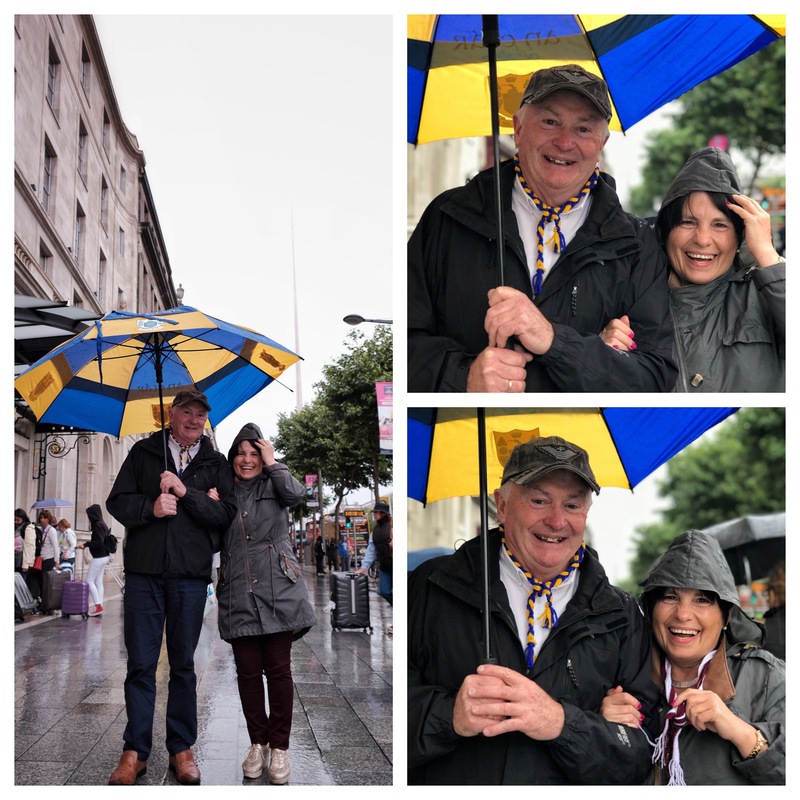 But my parents, God rest them, told me not all Tipp fans were happy. 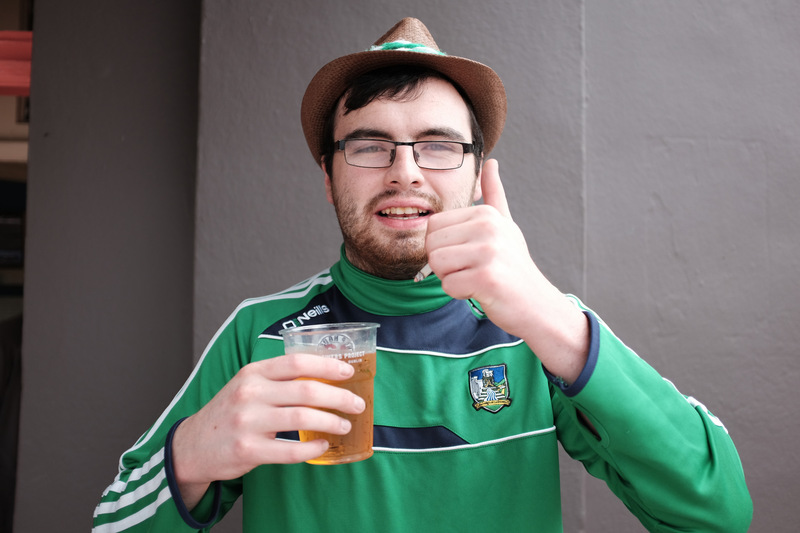 No, there was one man who left Croke Park covered in my vomit. Apparently, I threw up all over him. Being on the road with this project means that I am getting to see some familiar faces. 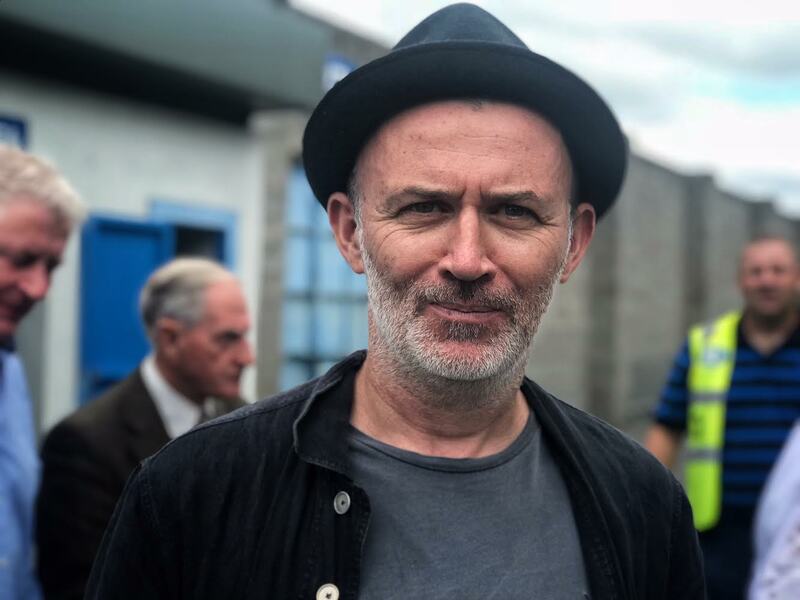 I first bumped into Patsy Murtagh on the pitch at Parnell Park when Kilkenny stole it at the death from Dublin back in May. 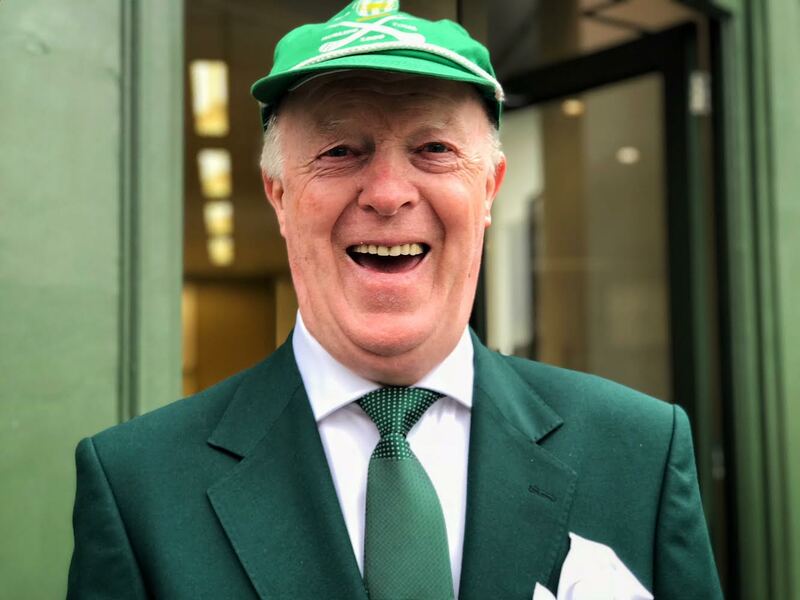 Patsy was beaming that day. It was lovely to show him the photo I got of him on that occasion and to get chatting with him. 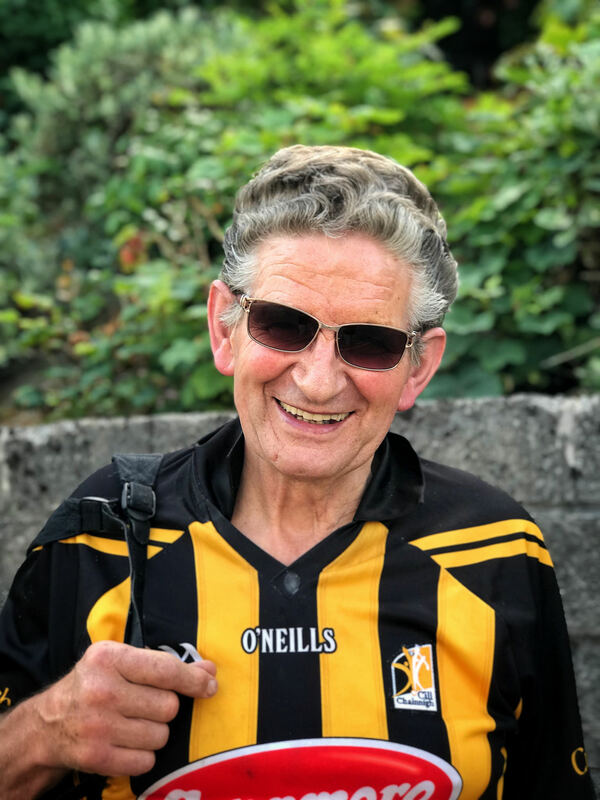 Kilkenny people are passionate about hurling and I always find them to be very fair and I don’t think I’ve ever come across one who, despite all their success, gloats. Patsy had ‘Henry is still King’ on the back of his Kilkenny jersey. 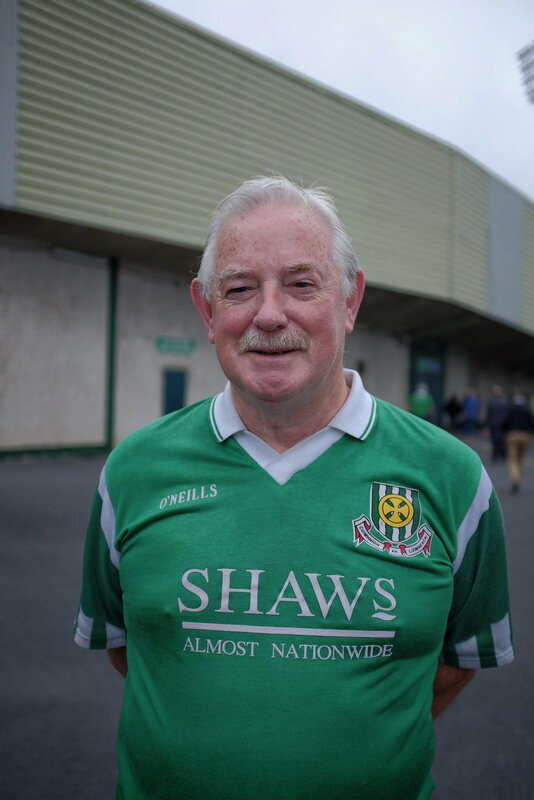 “I’ve been going to matches since the 50s, he said. I have seen them all – Ring, Doyle, Kehir, DJ, Sheflin. Who was the best? I asked. You cannot compare eras, he said. It’s impossible to imagine the players from years back playing now with all the advances and advantages thru have. And you cannot imagine the players of today playing in the conditions of the past. I loved Patsy’s honesty and enthusiasm for a game he has been following his whole life. 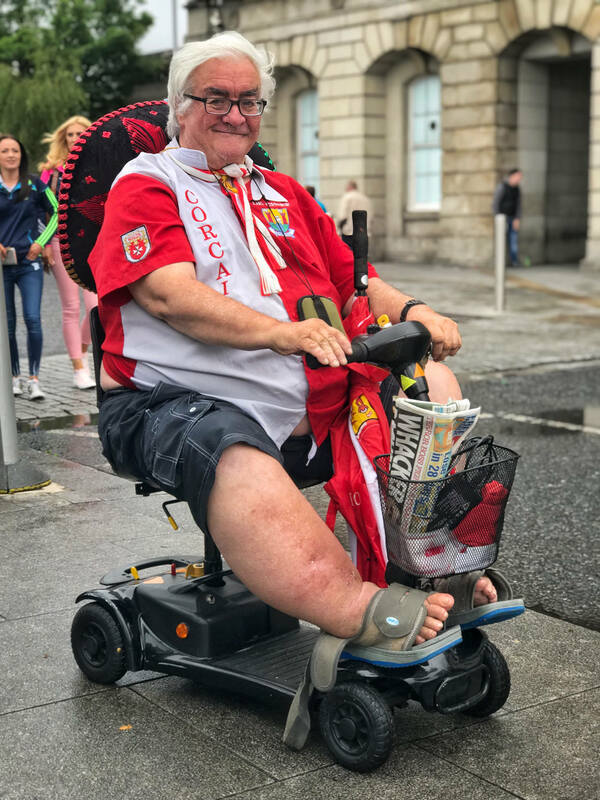 A little up the road from Patsy I came across a Kilkenny fan who was just setting out on his journey following the cats. 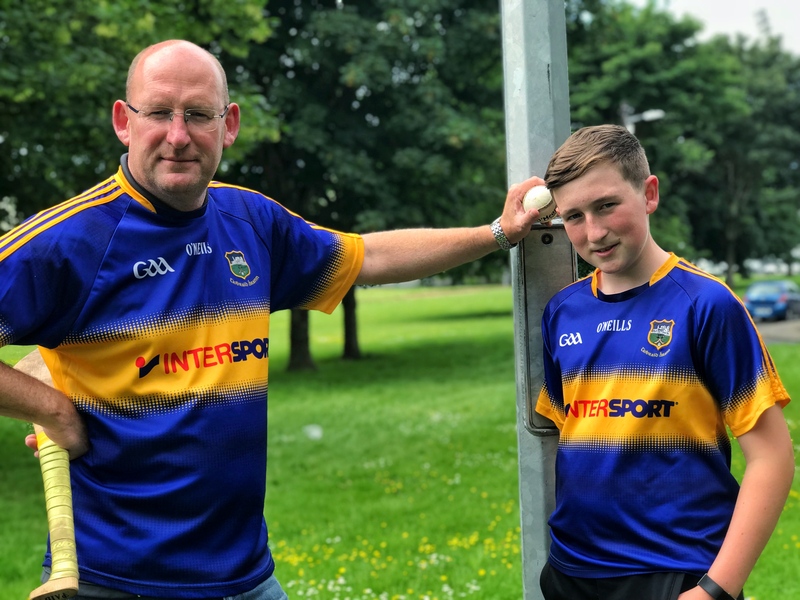 Patrick Jr. Noonan with his father Patrick Snr. “He sleeps with his hurl, Patrick told me. “Dreaming of playing for the black and amber, I said. 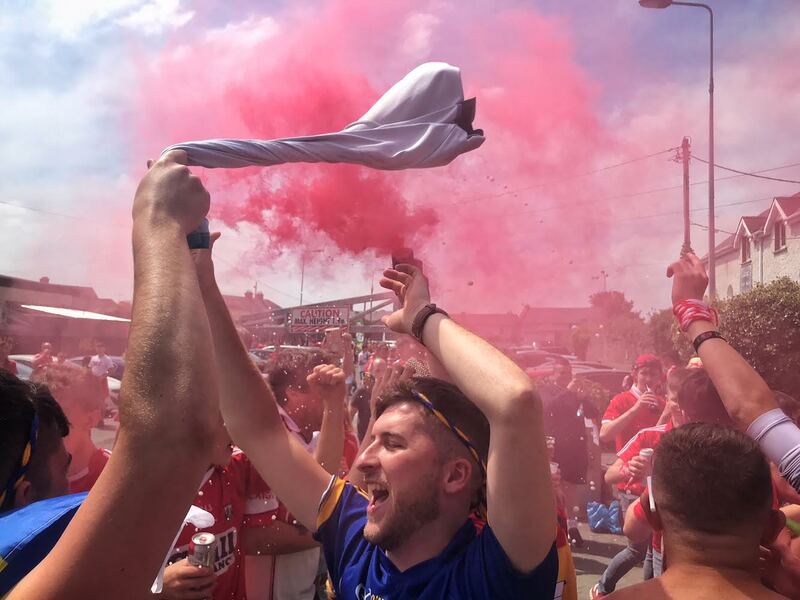 What’s following your county about lads? 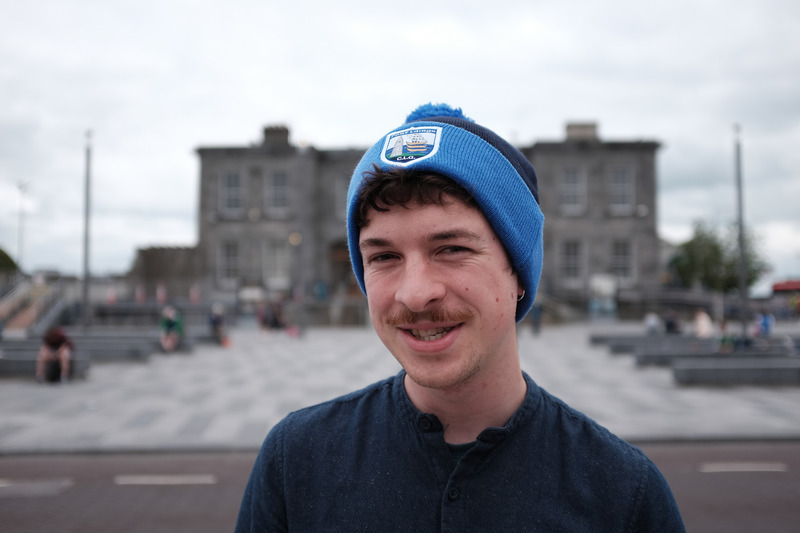 What does Wexford mean to? 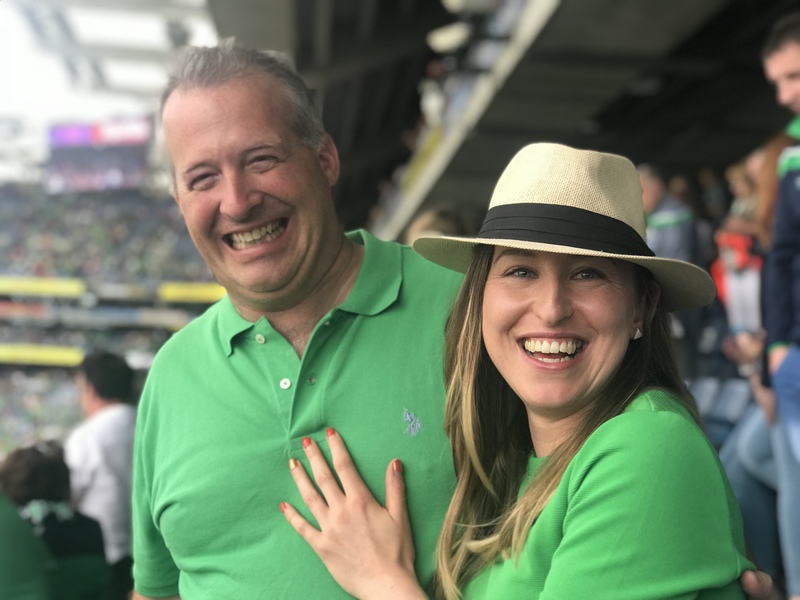 Going to the games together; what is special about it for ye? Mark Wallace, Kevin Doyle and Darren Murphy were the strong silent types; none offering an answer. Eventually Kevin said: it’s an excuse for pints. And all that goes with that, I suppose, I said. Ya, ya, all that, Kevin said. 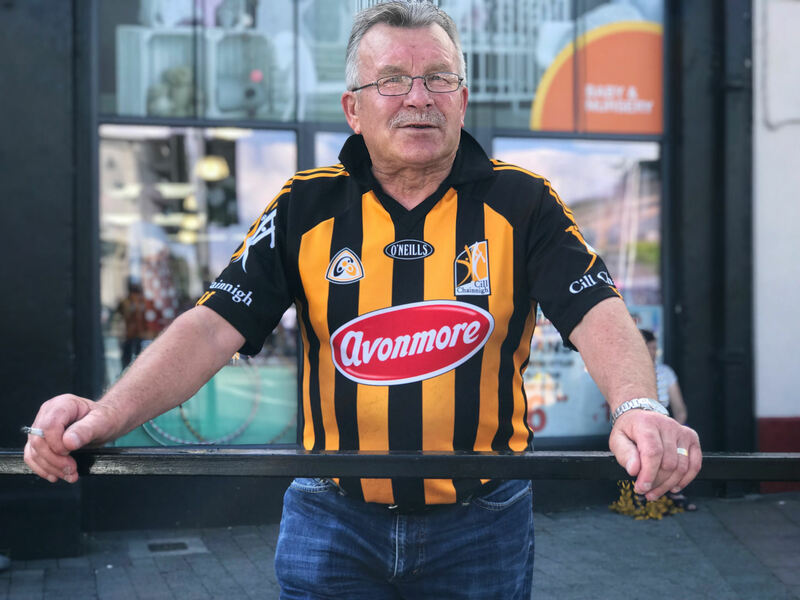 Tony Tierney was standing opposite me on the Main Street in Kilkenny, proudly sporting his Kilkenny jersey. 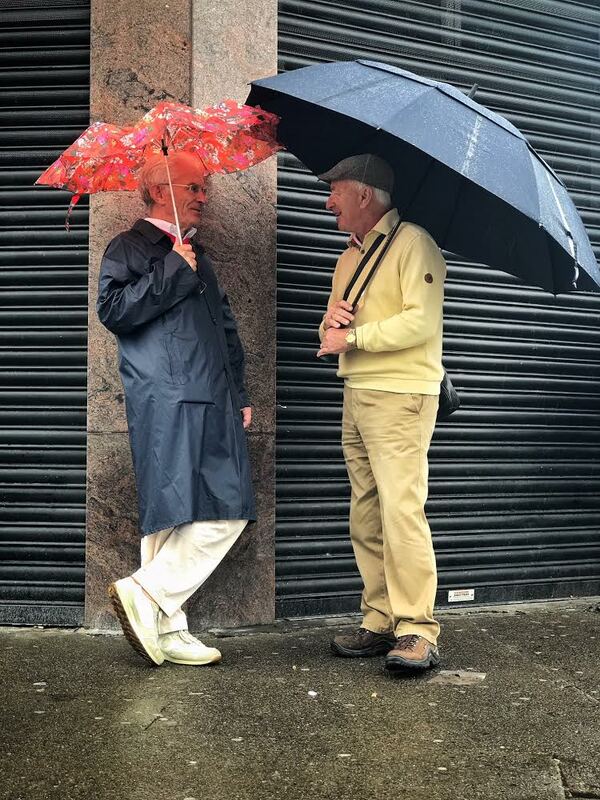 When I approached him and told him about my project he started to list off the years Kilkenny has won All-Irelands under Cody. 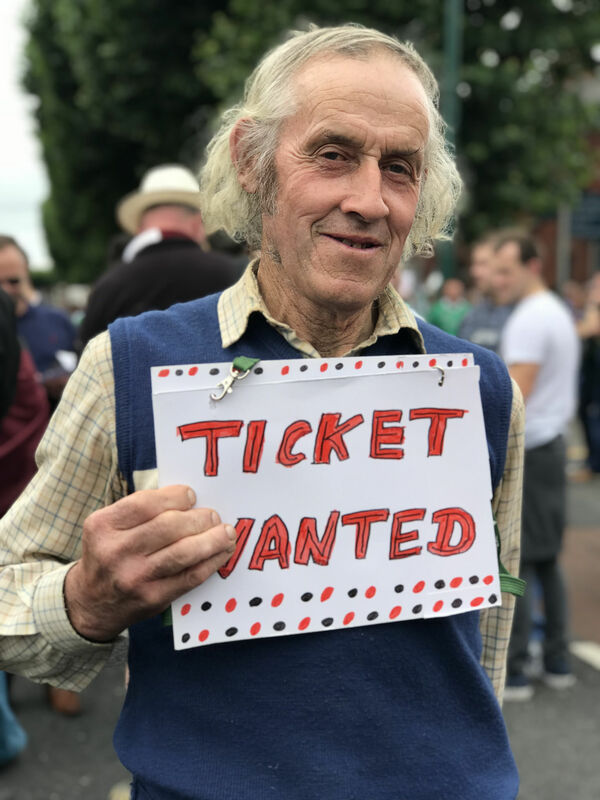 He told me he had not missed a Kilkenny final since 1963. We lost a lot too, he said. Not enough to Cork, though, I said. Tony winked and. smiled at me. 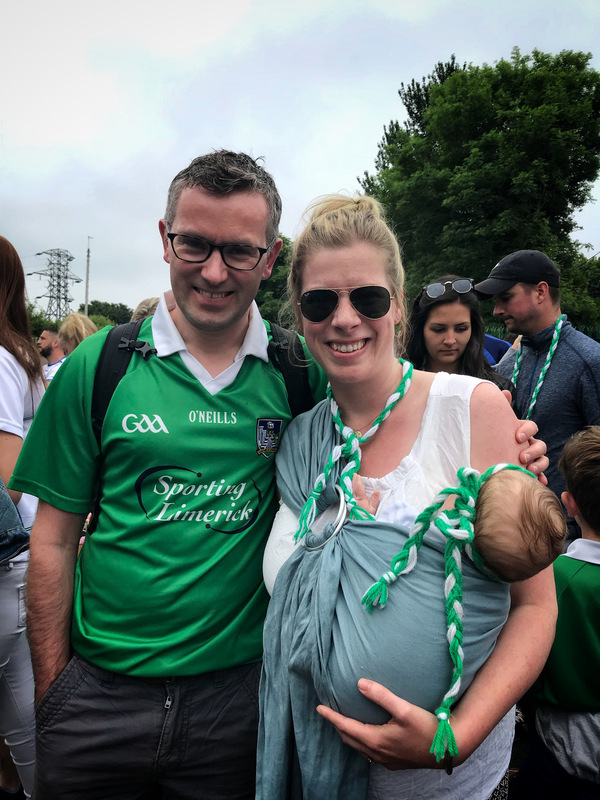 What’s hurling? I asked him. A game of men in action, he said. 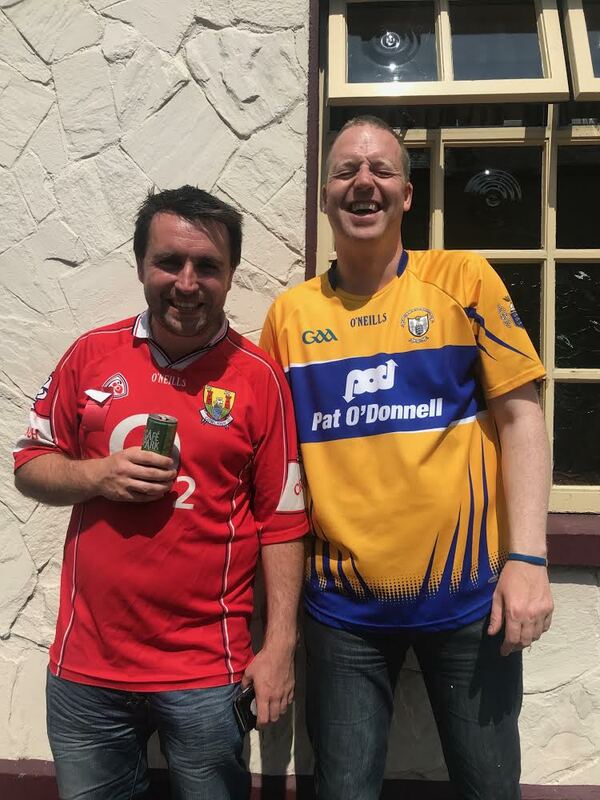 The first game we went to was the 1996 All-Ireland final (Wexford beat Limerick), that was not a bad one to start with. Who brought ye? I asked. Our father did. 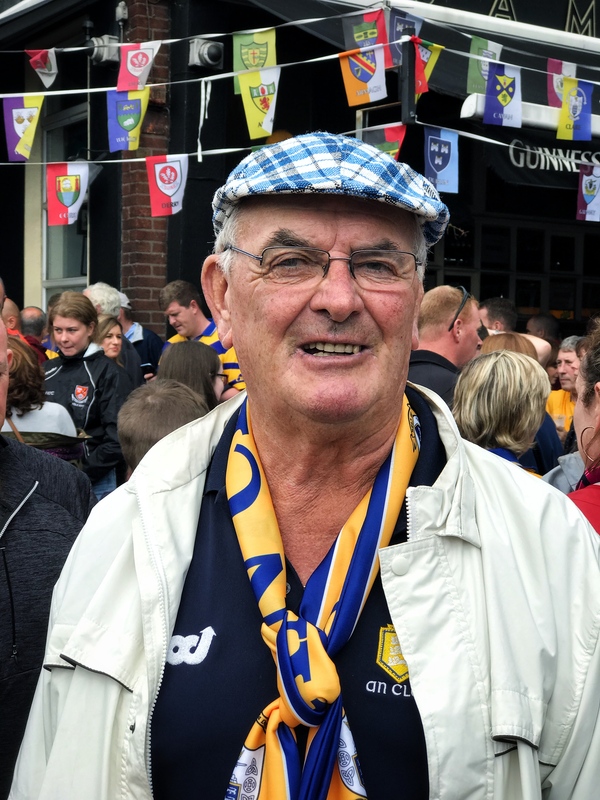 “Jimmy played inter-county hurling for Wexford from 1978 to 1992, his wife Kathleen told me. When he was playing; did you ever worry about him getting injured? I asked. No, Jimmy was tough, she said. Hurling is what we do. It’s our way of life.” Jimmy added. Jimmy Holohan with his daughter Liza and wife Kathleen. In 1982, I went to my third All-Ireland final to watch strong favourites Cork take on an unfancied Kilkenny side. I remember the game turning in the space of about two minutes when Kilkenny’s full forward Christy Heffernan scored two might goals for Kilkenny. I was heartbroken that day. Walking a long the main street in Kilkenny I saw this tall, slim, red-headed young fella come towards me with his friend. Eoin Heffernan. 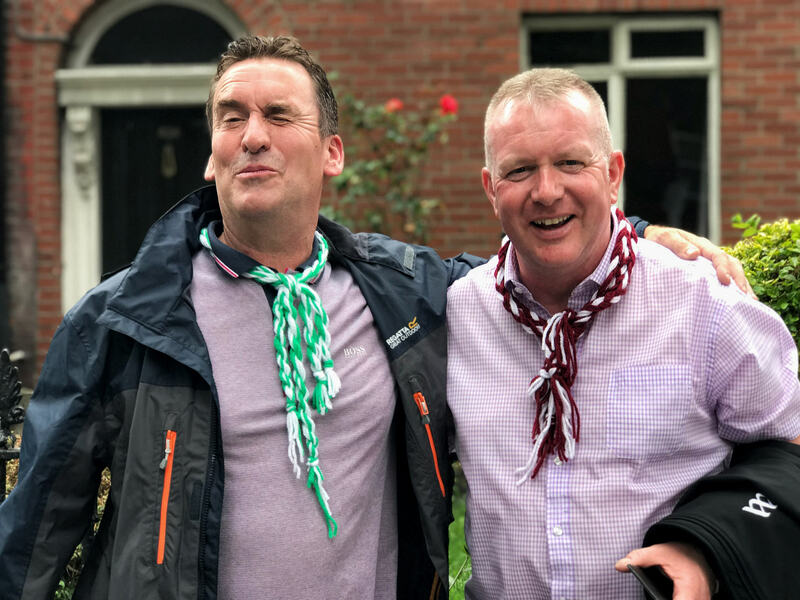 Yes, a nephew of former Kilkenny great – Christy – and his friend Michael Boyle. Two great guys. 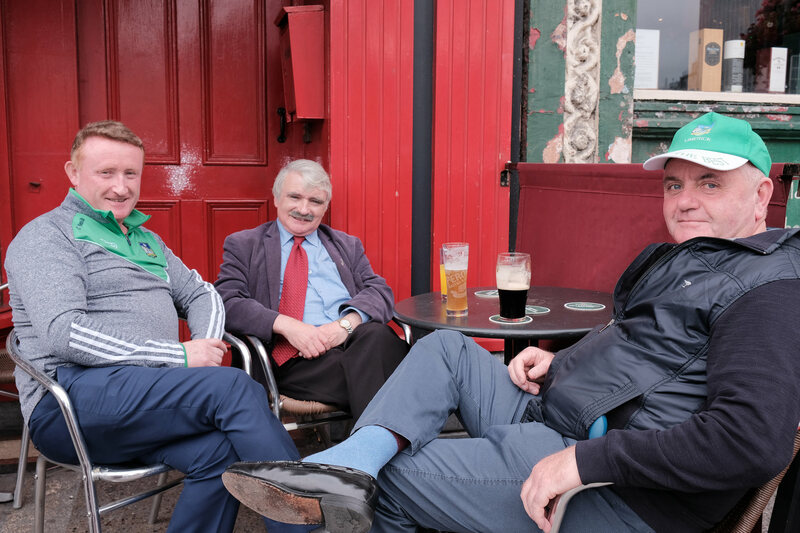 I could have stayed chatting hurling with them for hours. Who do you like to beat most? I asked. Tipp! They both said. 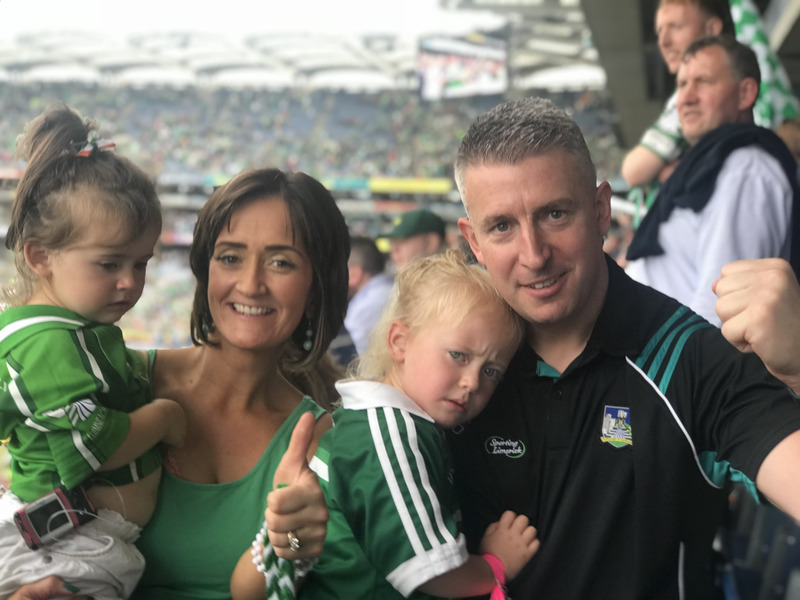 We’ve made a deal to follow Fermanagh in football for Emma. But you said she’s a Wicklow woman, I said. Ya, but my father’s from Fermanagh. 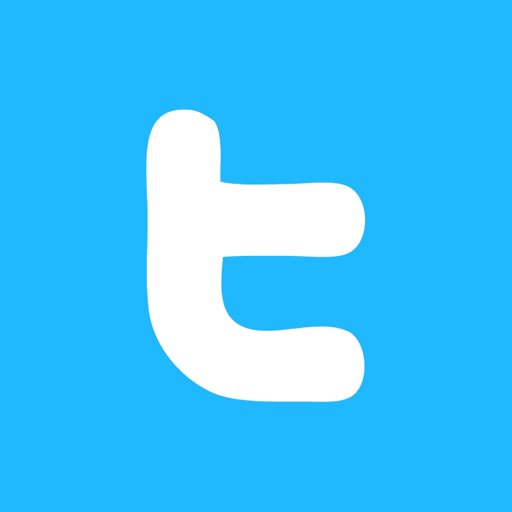 So, I follow them in football. 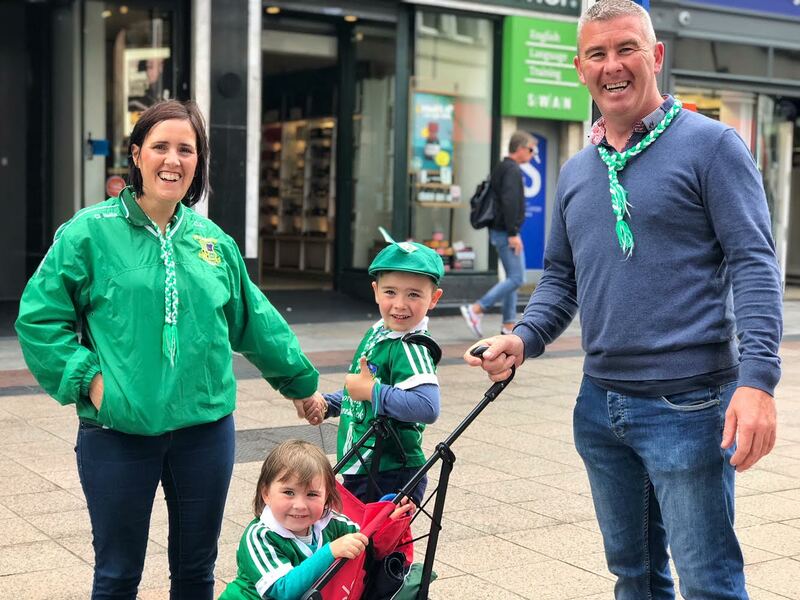 Aido Tobin and his girlfriend Emma Fitzpatrick from Wicklow and their friend Rob Carty. 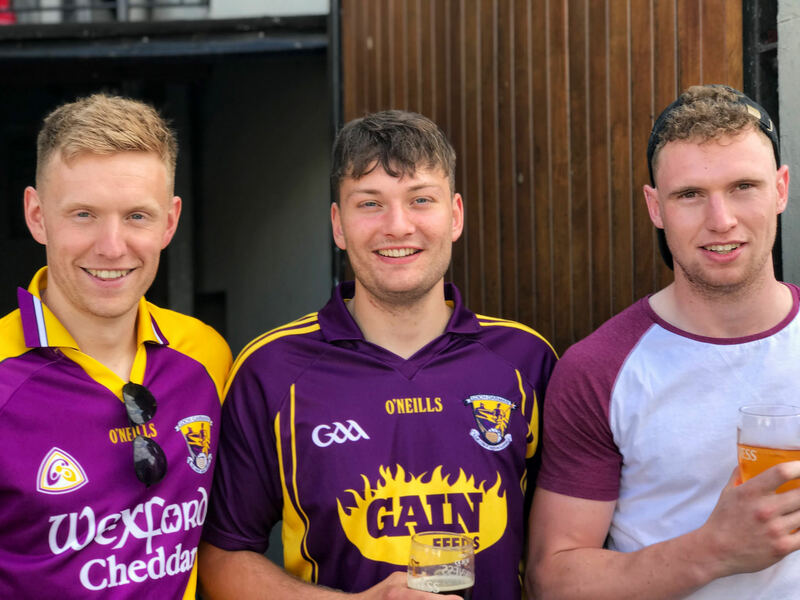 At half-time in the game Sky Sports laid on the entertainment when the three guys from A League of Their Own, Freddie Flintoff, Jamie Rednapp and Rob Beckett took penalties on Wexford’s Damien Fitzhenry. The three guys were trained by DJ Carey, but to be honest DJ could have done a better job. It was past 11 before I got home on Saturday night. 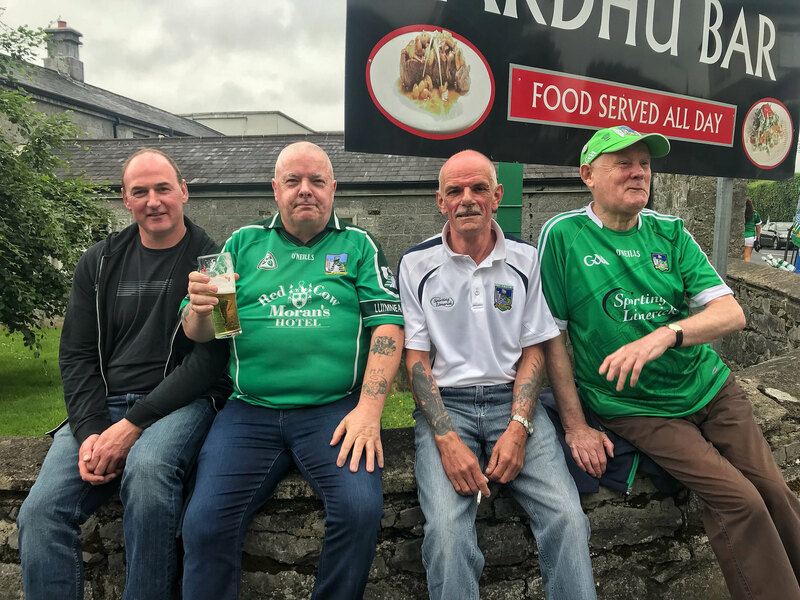 I was up early the following morning to head to Limerick for their clash with Waterford. Read about that in my next blog post. 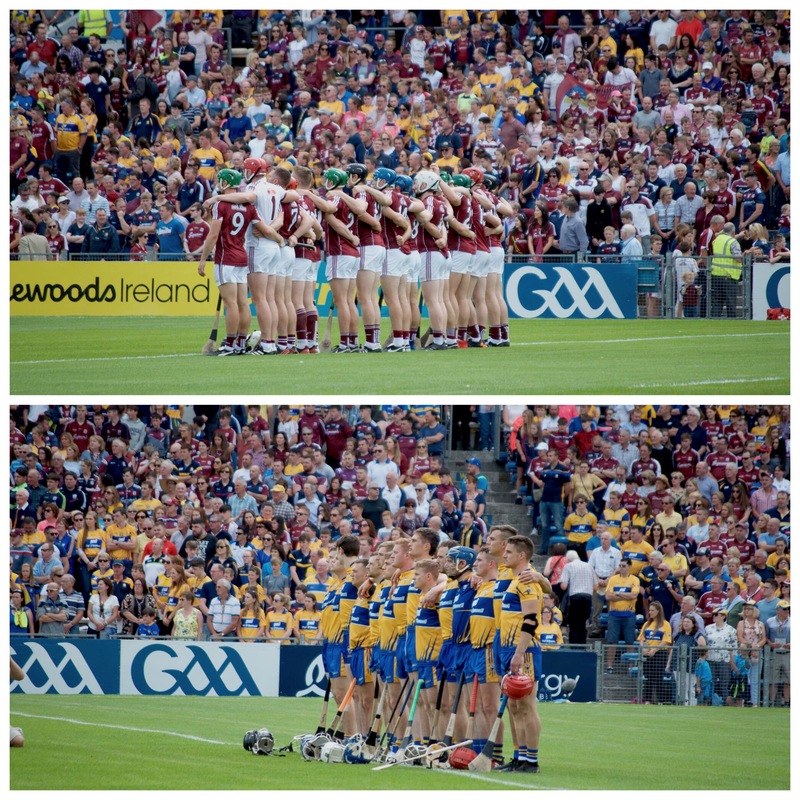 What a weekend of hurling. 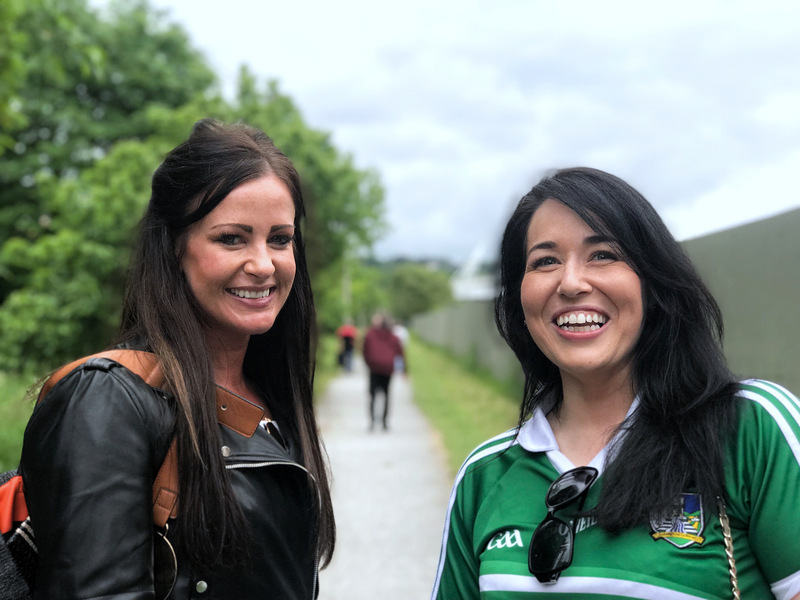 After Saturday night’s thrilling encounter between Cork and Limerick, I was treated to another game that will live long in the memory in Limerick. 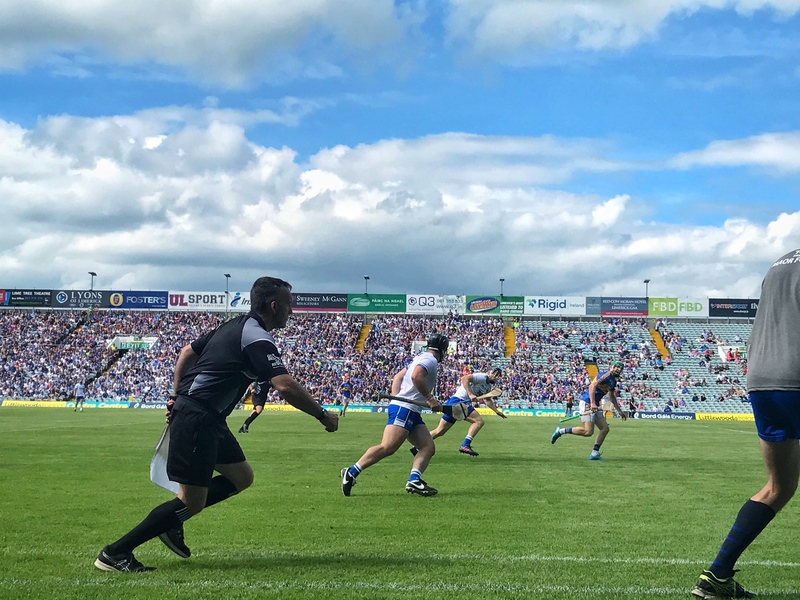 Tipp looked like they had forgotten what made them a formidable side as Waterford drove through them in a one-sided first half. 2 goals to the good at 35 minutes and Tipp a man down, things were looking good for this makeshift Waterford side. 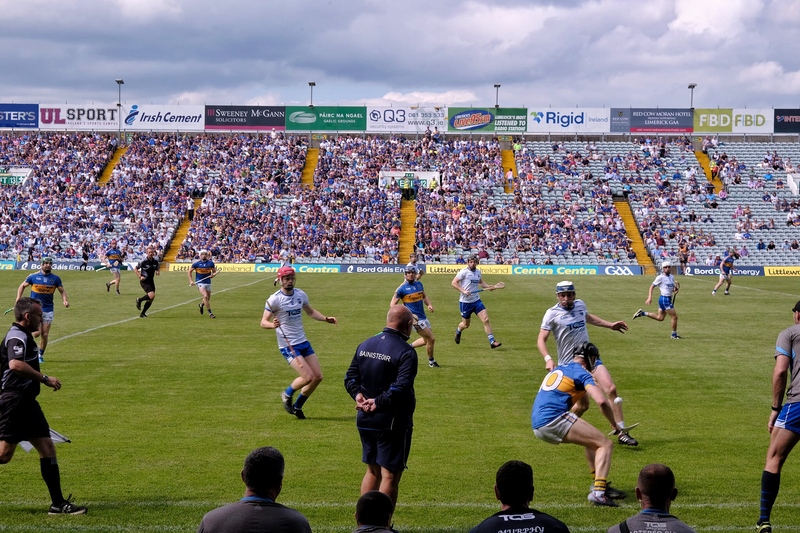 The Tipp bench seemed out of ideas as they subbed their big name players and fell 11 points behind a buzzing Waterford team in the second half. With 13 minutes to go they were 9 behind. 5 minutes later they were 1 behind and the game had swing incredibly in their favour. 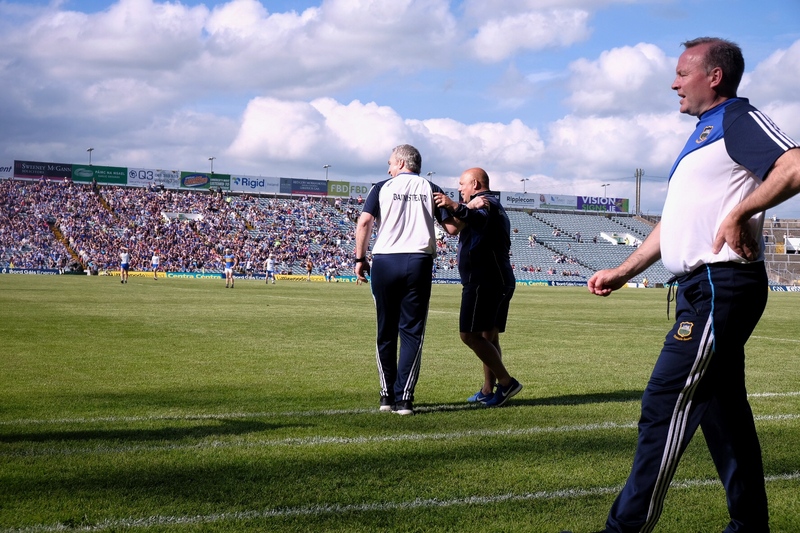 Even more incredible were the refereeing decisions that went against Tipp. The umpire who was right next to Austin Gleeson as he fielded a high ball on the goalline somehow saw fit not to argue his case against the umpire on the opposite side who raised the green flag for a goal. No Tipp player called for the goal. Gleeson had not caught or carried the ball over the line. The referee consulted one umpire, not the one who had best sight of it. The goal stood. 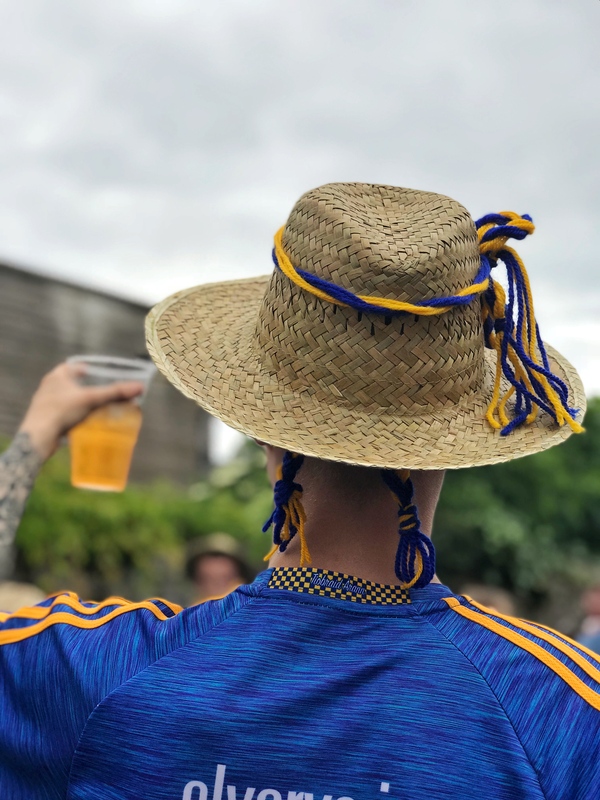 Tipp were back in it. A few minutes later Tipp shot for a point. The umpire waved it wide. The referee overruled him. Games, championships, careers turn on decisions like this. This game did. 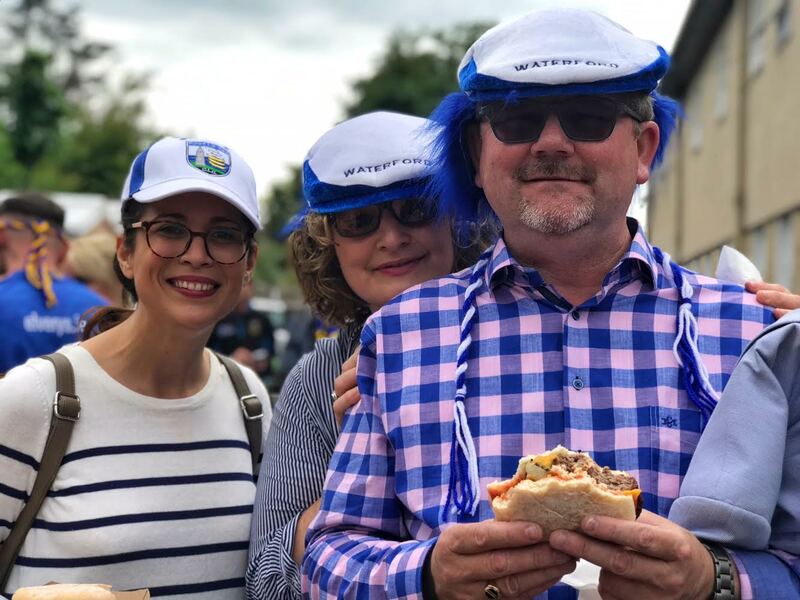 Waterford’s championship might. Derek McGrath’s Waterford career may well do so too. 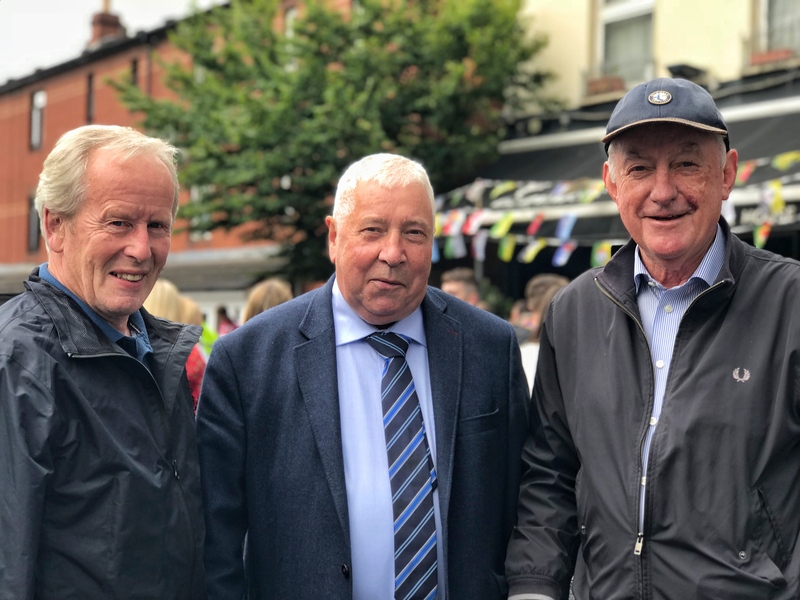 As with many GAA matches, a draw was salvaged with a pointed free. 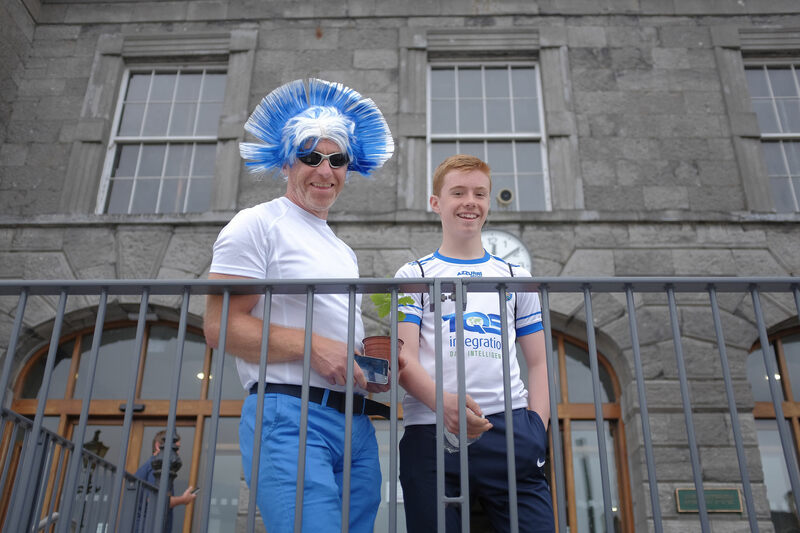 Waterford have every right to feel aggrieved. Credit to Derek McGrath that he did not complain post match about the ref’s decisions. They deserved more from the game. 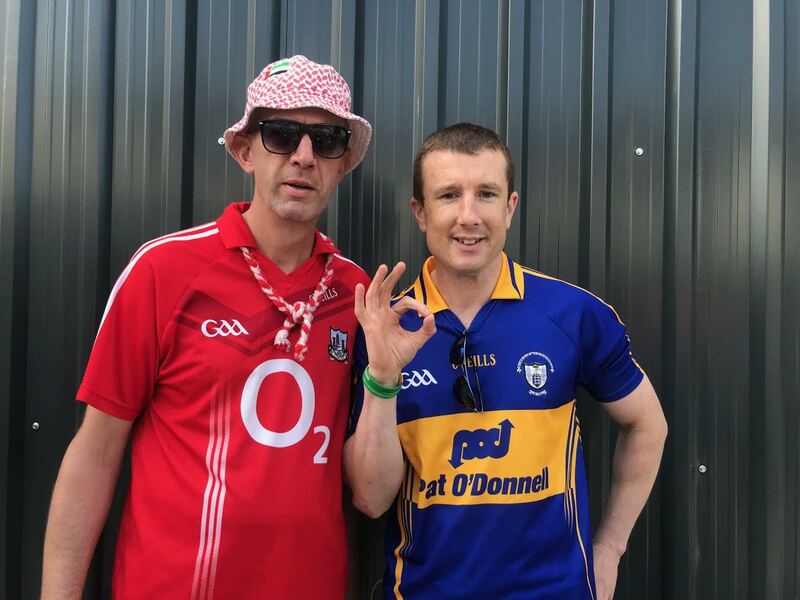 Tipp, for their part, need to play from the get go. They look flat. They look vulnerable. 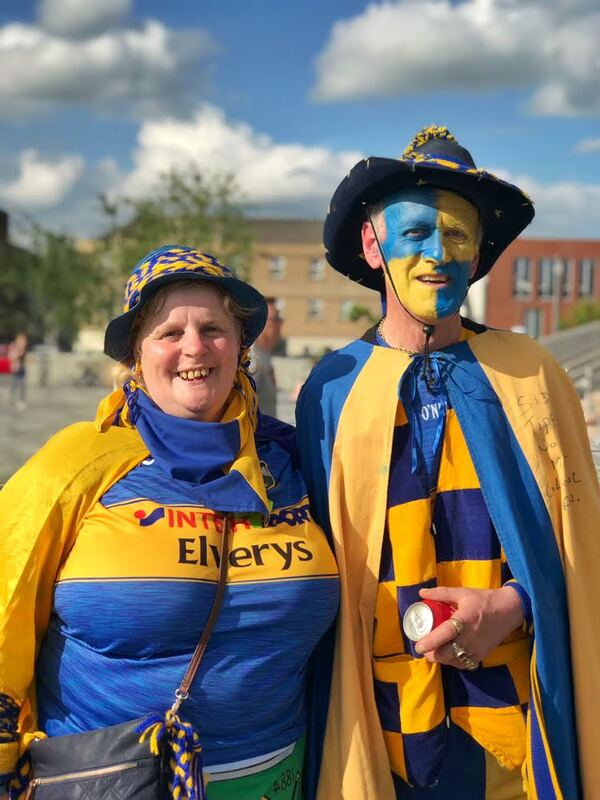 Clare will come to Thurles smelling blood. Waterford played some lovely skillful hurling, but tired at the end. They face a strong Limerick side next Sunday in their third game in 15 days. It’s a tough ask for these young players to raise their game again. 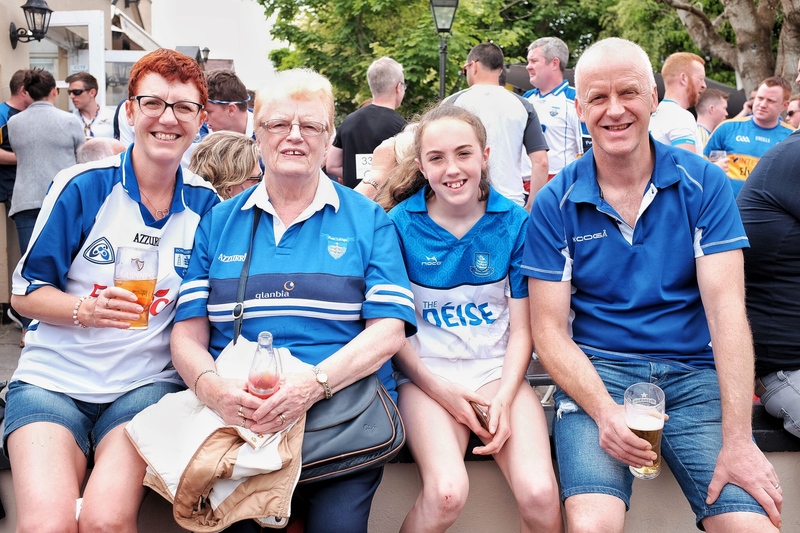 But maybe next week will be Waterford’s turn for some good luck in this thrilling Munster championship. 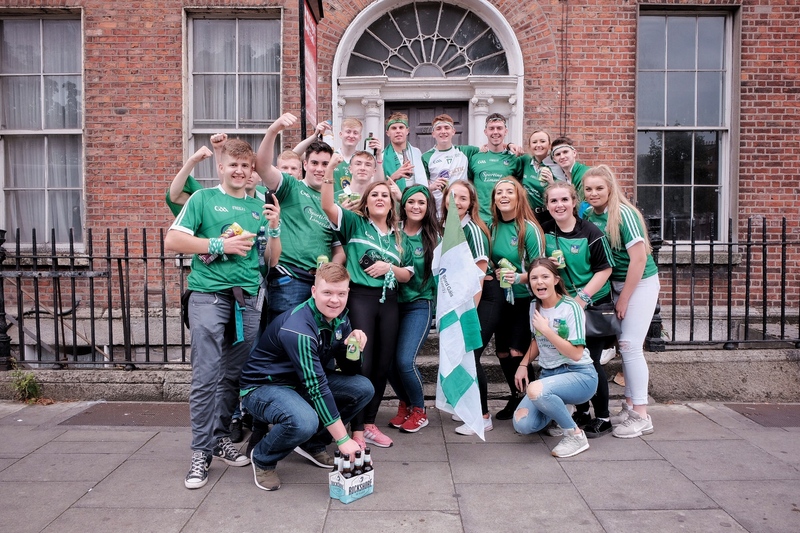 After a long walk from the station I found both sets of supporters were gathered outside Woodfield House on the Ennis Road. 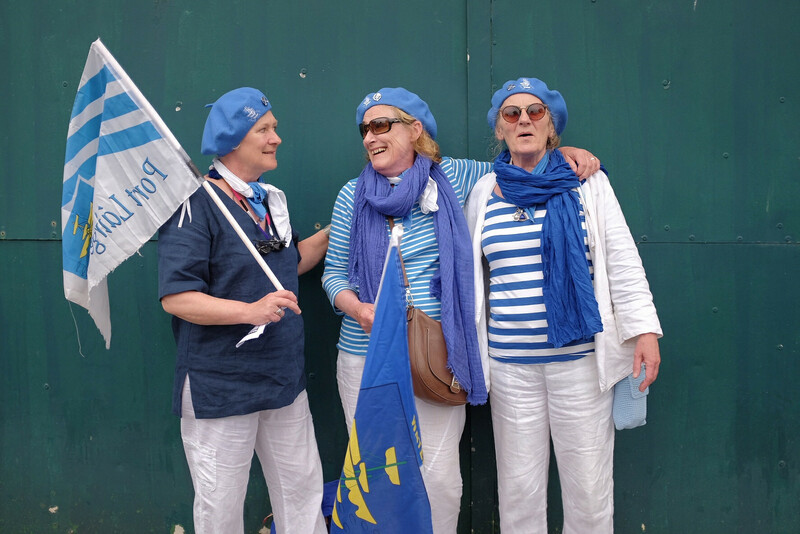 The first people I got speaking to were three Waterford supporters but not one of them were from Waterford. 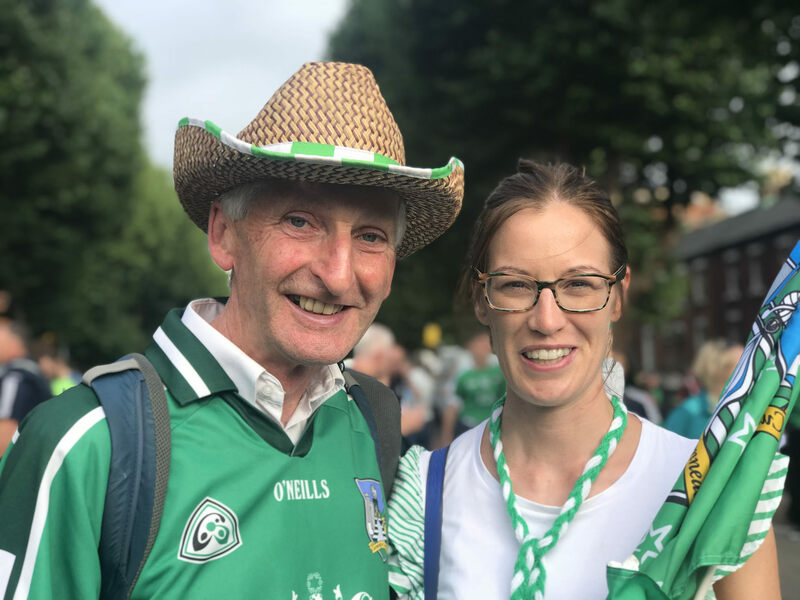 Kevin McNair and Lorraine Dollard from Tullamore had brought their Greek friend Eva Angeli to her first hurling match yesterday.“What do I know about hurling? It’s aggressive. It’s fast. And Waterford will win!” said a confident Eva. 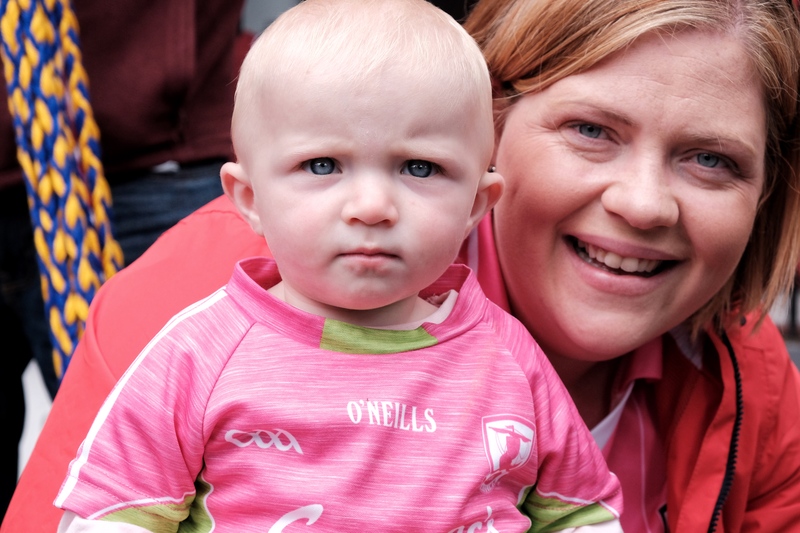 “We want to expose her to Irish culture and hurling is the best of Irish culture. Just look around here. Everyone together, having the craic and then the game. She loves it!” said Kevin. Being a language teacher, I had to teach Eva some useful phrases for the game and in return she taught me a Greek one: Pame Waterford, but I will have change that to Pame Cork! 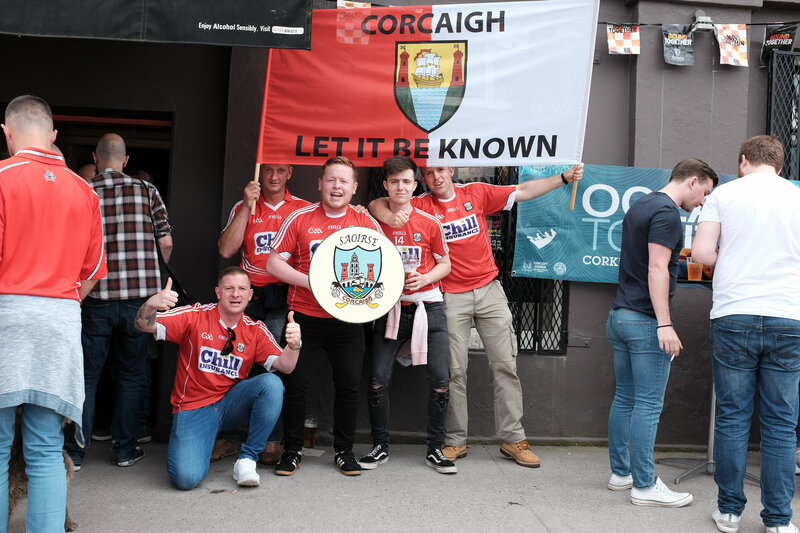 Come on, Cork! 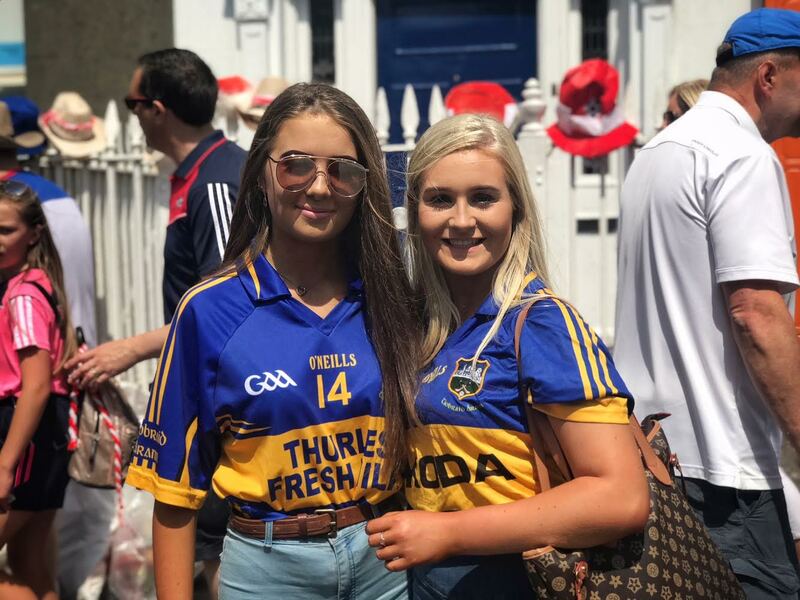 Just behind them was a large and loud group of Tipp fans, enjoying a few drinks before the game. They welcomed me into their company and, in fairness to them, they were patient as I tried to get a shot of their colours. “Take a photo of our flag. We have a flag for our son, Eric. He died by suicide.” Eric’s father told me. I could not help but feel sorry for them, but at the same time I had admiration and respect that they would remember their son and brother in this lovely way. “I’ve been bringing my niece, Patricia, since the 70s.”“Patricia, she’s my only niece.” Mick Duggan told me. “You’re going to games for years, what does it mean to you? I asked. “Oh, hurling is everything. Winters are long. We have to wait for the summer. “When we win, of course I celebrate. 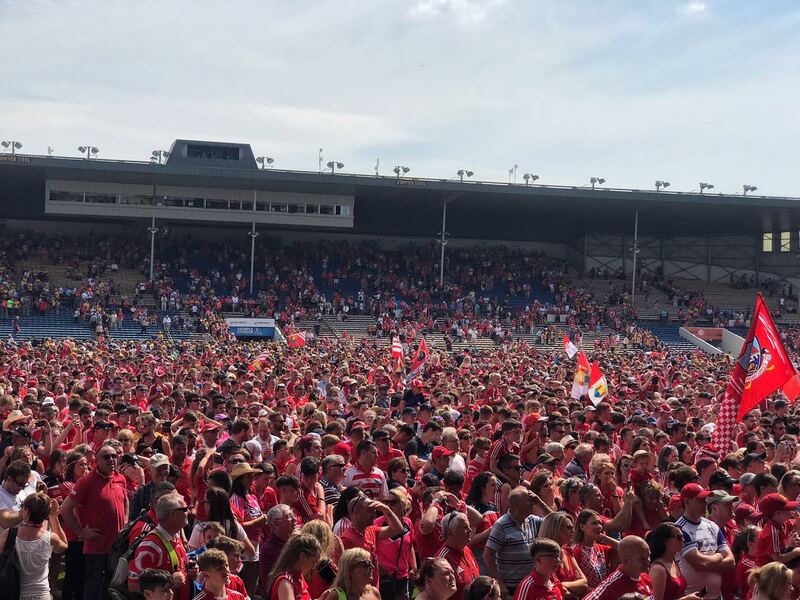 The homecoming in Thurles. Nothing like it.” Patricia told me it was her turn how to bring him to the games. Mick looked at his niece and said: Come on, will ya. I don’t want to be missing the parade. 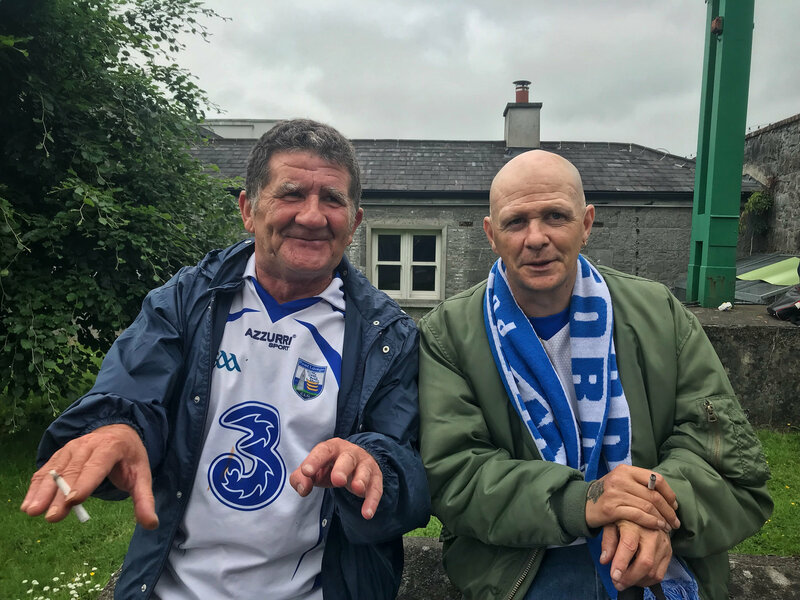 With all the people who go to the games it is unusual to bump into the same people two weeks running, but that’s what happened when I ran into Tipp fans John and Robert Gunnell. 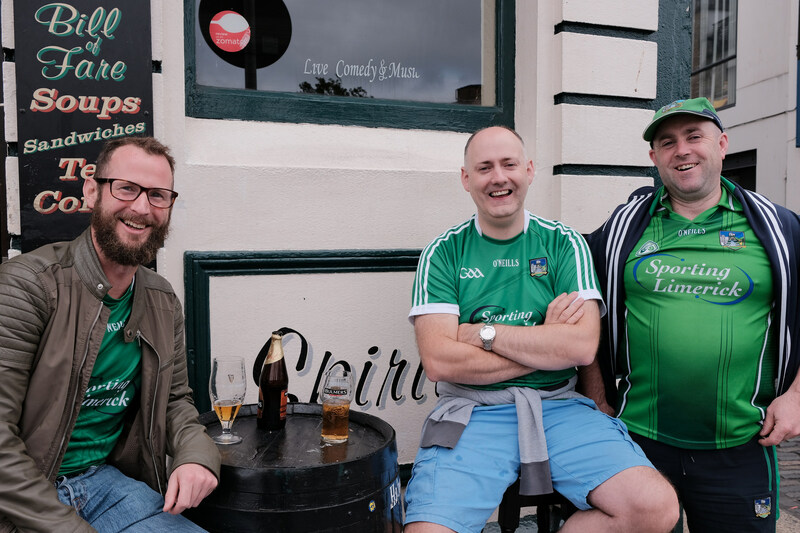 I had seen them at half-time in the Cork Tipp match the previous week. “You were right!” John said. “You said it wasn’t over, and it wasn’t.” Unfortunately, I was right. 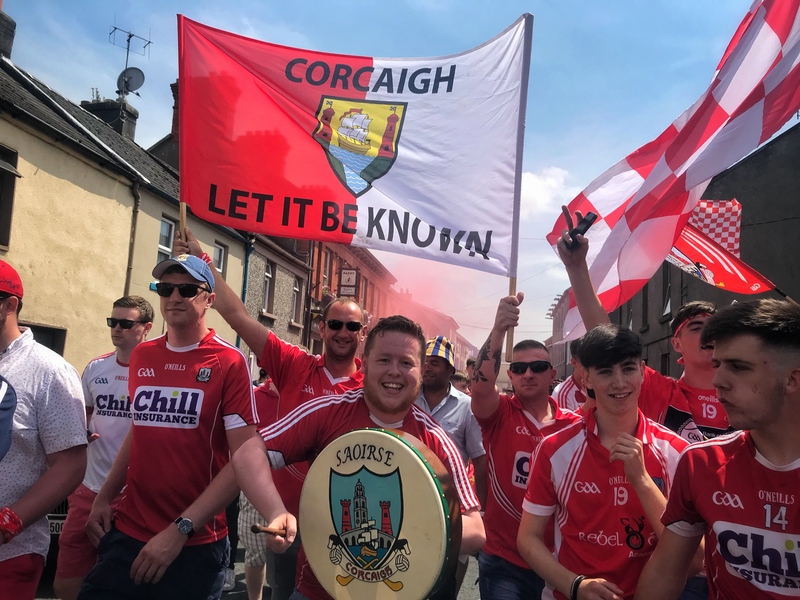 Cork were not able to repeat their first half performance against Tipp the previous Sunday. I love how John and Robert Gunnell bring their hurleys to the match for a puck around before the game. “He’s not my husband. He’s my match-day partner. My husband is at home.” Does he mind? I asked. Not at all. Does it take ye long to get ready? It takes me a few minutes, but Margot takes much longer,” Sid told me. 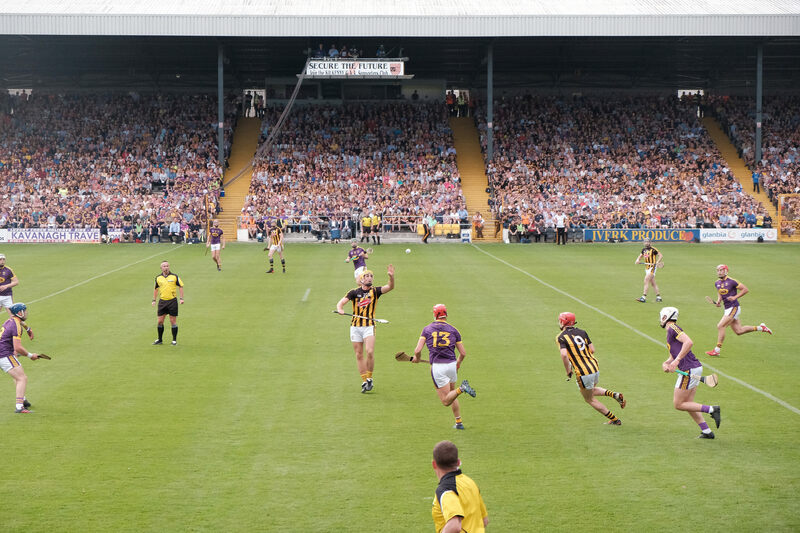 Next up for me is a trip up to Nolan Park on Saturday to see Wexford, the only team I’ve yet to see, play Kilkenny. 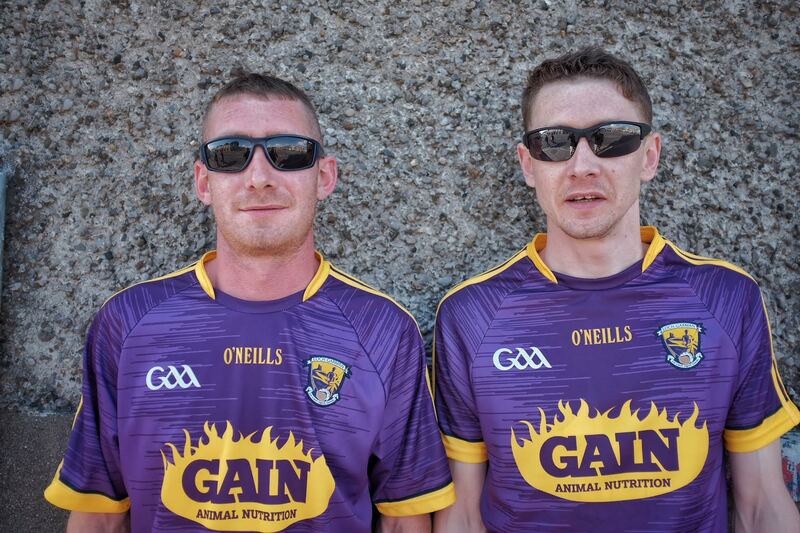 The winner will qualify to meet Galway in the Leinster Final on June 30. 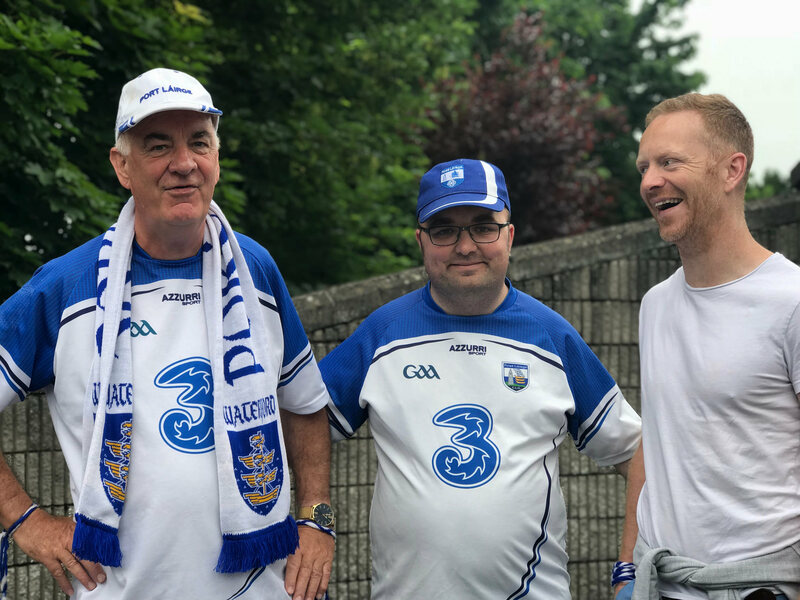 I am still not sure of what game I will go to on Sunday; back to Limerick to see them take on Waterford or to Thurles to see Clare play Tipp. Which should I go to?